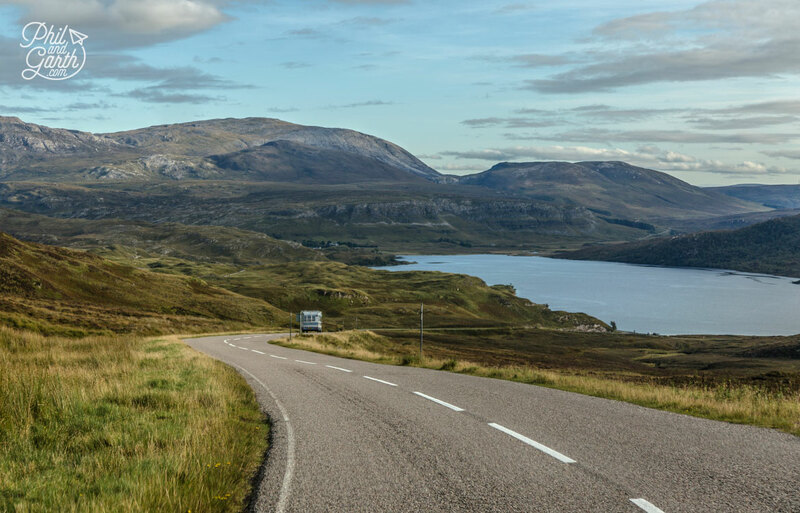 We don’t often explore the UK, so we decided to try a longer staycation with a road trip through the Scottish Highlands along the ‘North Coast 500‘ – Scotland’s very own Route 66! 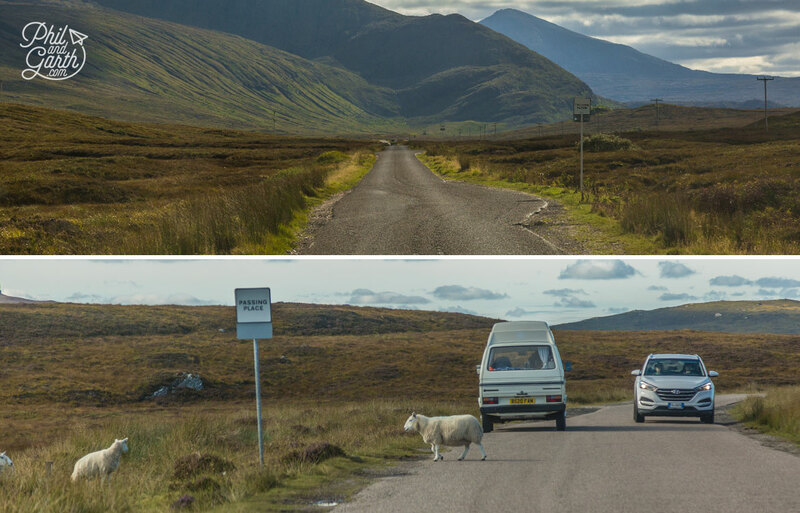 However it’s not the name of the road, instead it’s the route named by the Scottish tourist board to see the best of the Scottish Highlands. 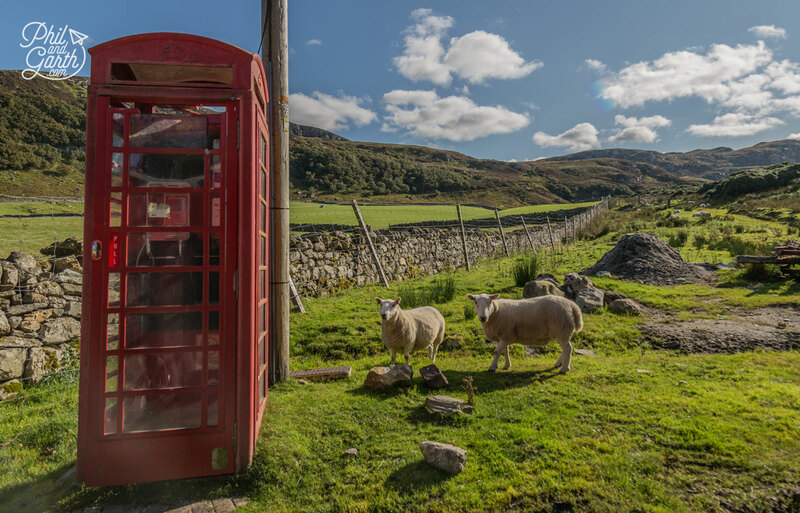 For those who don’t know Scotland – it’s one of four countries that make up Great Britain, the Scottish Highlands is the mountainous region in the North West of Scotland. 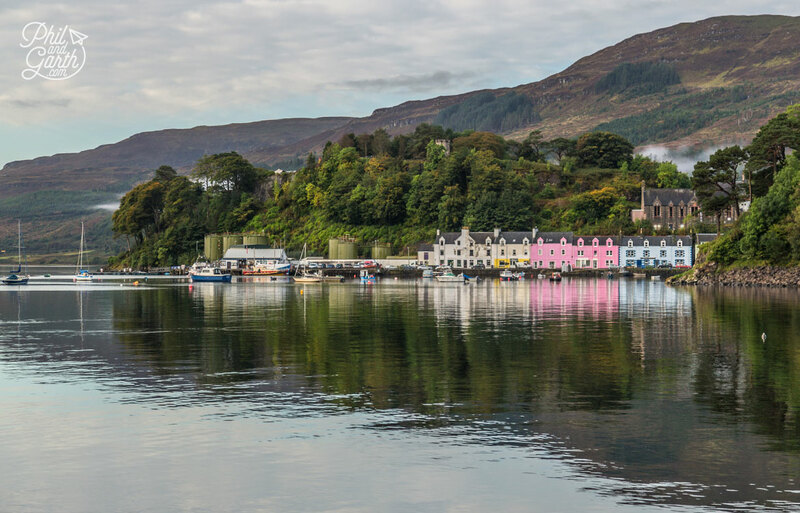 Get ready for jaw-dropping landscapes, gorgeous waterfalls, lochs, century-old castles and beaches that look like they are straight out of the Caribbean. 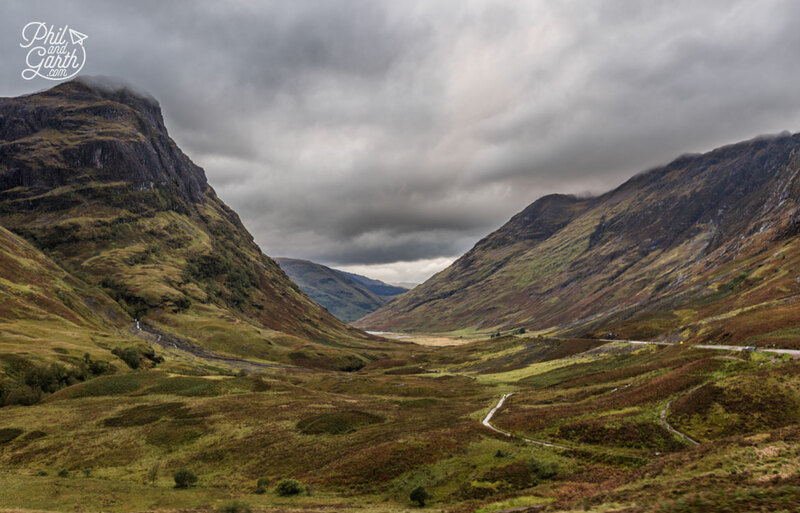 So no surprise the Highlands is a popular filming location as seen in many movies like Harry Potter, James Bond’s Skyfall and Netflix’s Outlaw King to name a few. 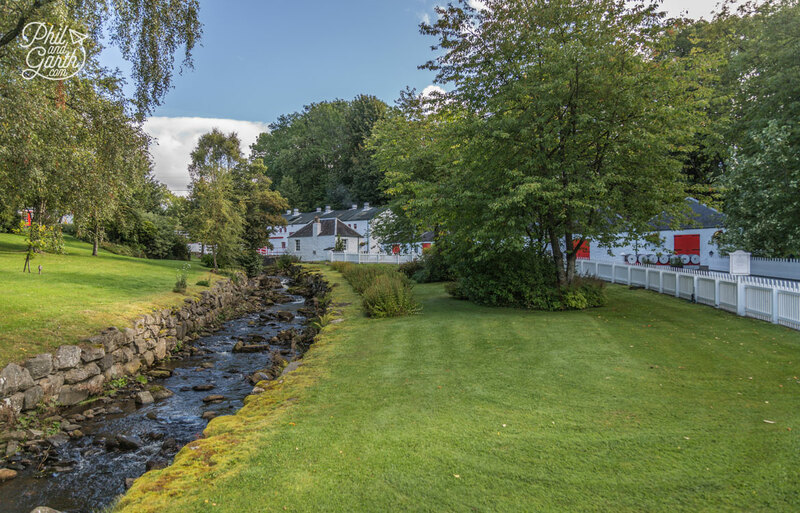 We spent 7 hours driving from our home in England to our starting point of Pitlochry – the gateway town to the Scottish Highlands. 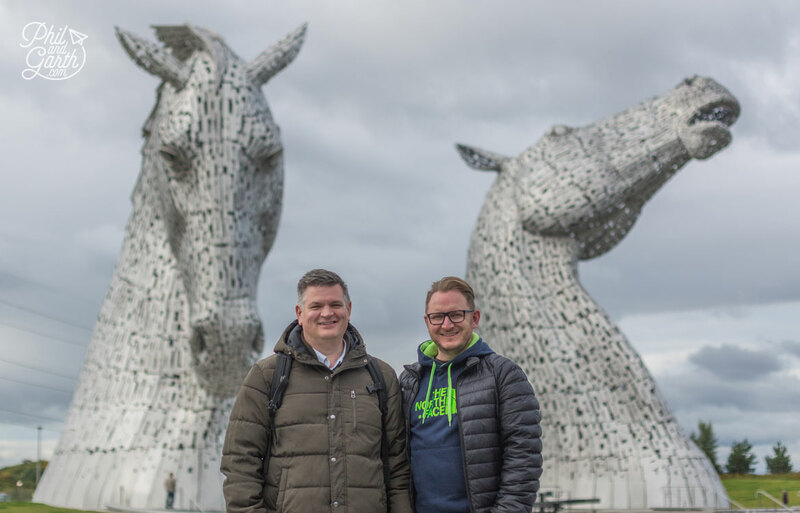 To break up the journey we stopped off for a couple of hours at Falkirk in the Central Lowlands (about 50 minutes from Edinburgh) to see the magnifcent Kelpies. 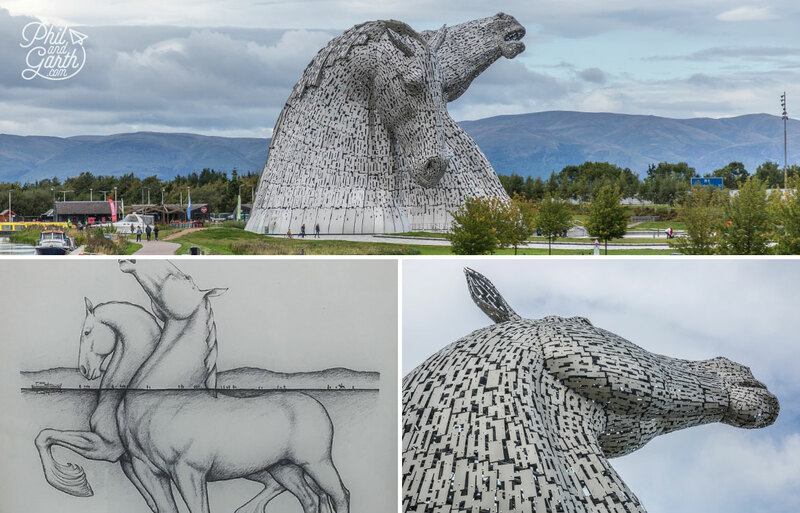 The Kelpies are 30 metre giant sculptures, built as a tribute to the working horses who used to pull barges along the canals here. The name ‘Kelpies’ comes from Scottish mythology – aquatic creatures who change their shape, often in the form of horses. At night the Kelpies are illuminated in red from the inside which must make them appear even more dramatic, shame we missed that, but we had to get back on the road. 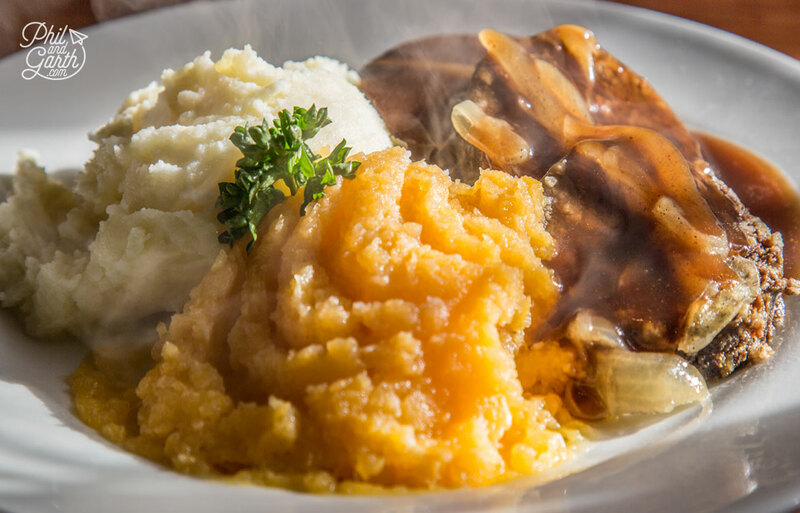 We finally reached our first B&B overnight stop at Pitlochry and headed straight out into the town for dinner to sample our first Scottish delicacy of ‘Neeps and Tatties’ – a simple dish of haggis, swede (neeps) and potato (tatties). Perfect comfort food after our long day of driving, finished off with our first ‘wee dram’ nightcap which would prove to be the first of many! 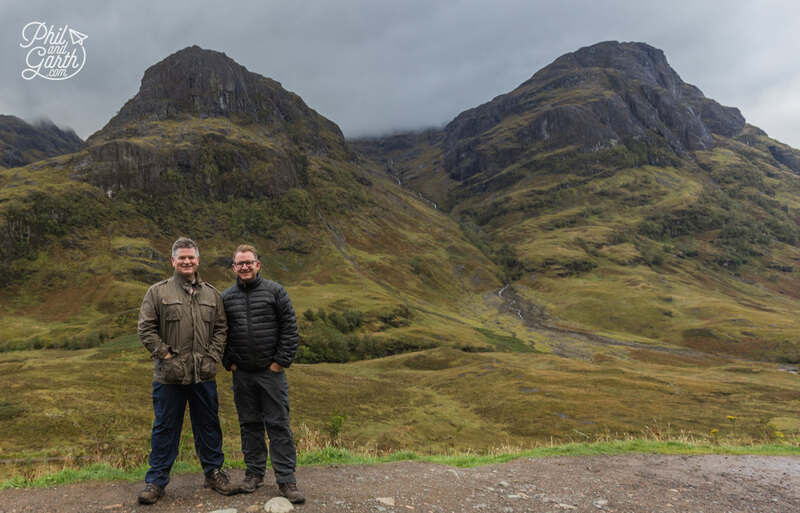 We were tired but excited about the start of our Scottish Highlands road trip the next day. Our first day started with a hearty Scottish breakfast of haggis and eggs, perfect! 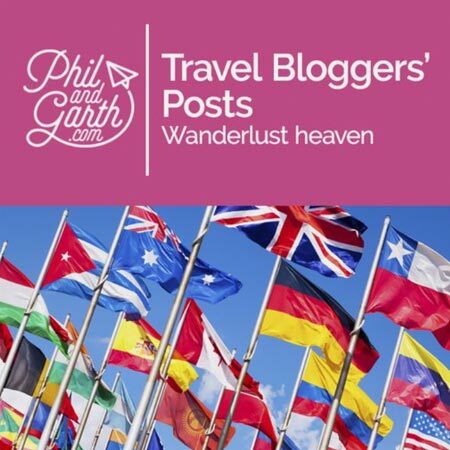 Phil loves haggis, but Garth prefers the veggie version (which most B&B’s offer). 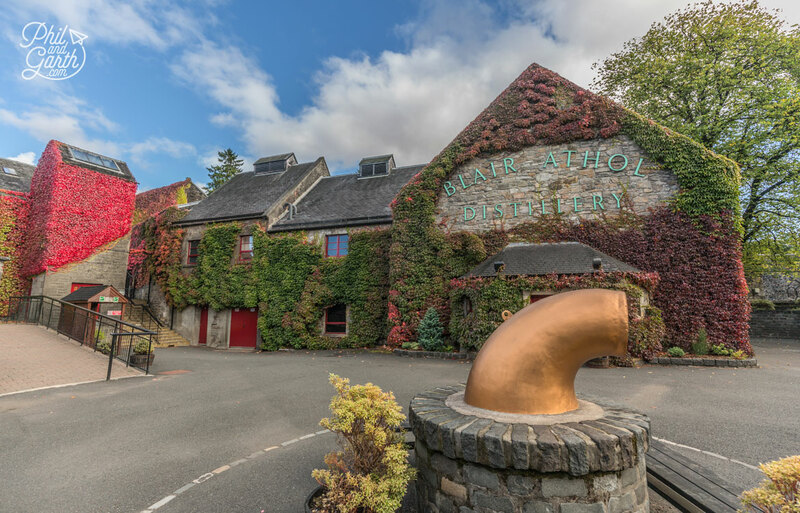 Our itinerary for day one started with two whisky distilleries based in Pitlochry, first up was the picturesque Blair Atol Distillery just a five minute drive from our B&B. 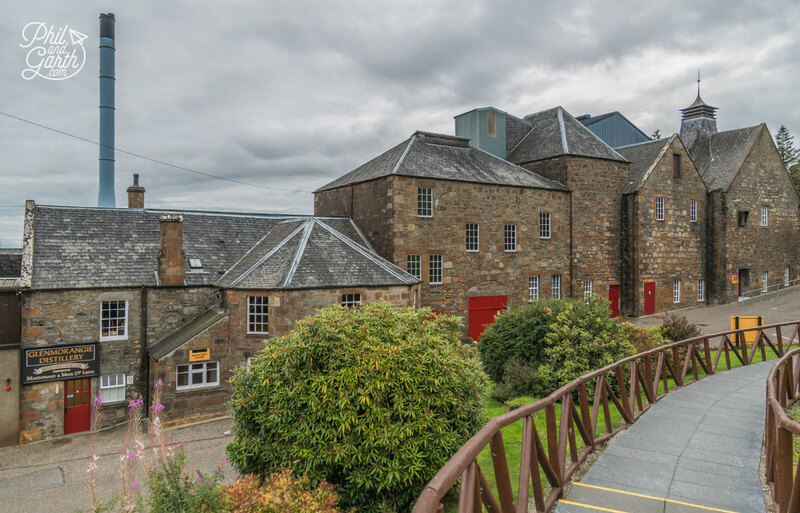 We soon realised it pays to book distillery tours ahead, as it was a long wait for the next available tour. Whilst we waited we tried some samples in the shop, well Phil did as Garth was doing all the driving and we bought our first bottle of a Highland whisky, we’ll explain later how single malt whisky is made. Next another short drive to the smallest distillery in Scotland – The Eradour. It dates back to 1825 and looks like a tiny whitewashed model village. It was a Sunday and it was closed! doh! unusual as most are open 7 days a week. 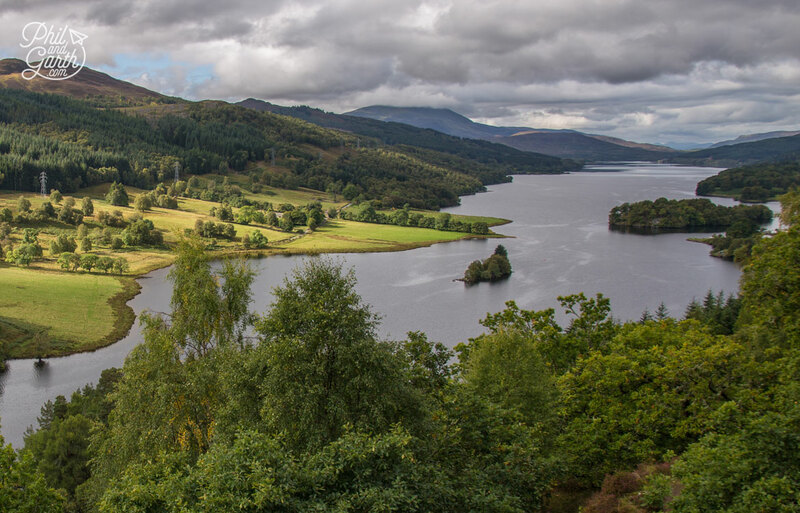 15 minutes from Pitlochry is the famous panoramic view of Loch Tummel with the Glen Coe mountains in the distance. Queens View is said to be named after Queen Isabella from the 14th century who used to rest here on her travels Queen Victoria also visited here in 1866. Surrounded by trees of the nearby forests, it’s a beautiful view across the loch, oh and the cafe and gift shop here are also really nice. Time to hit the open road again, and a 2 hour drive to the last stop on our first day – Loch Ness. The drive takes you through some lush forest roads, feels a bit like Norway and then over the Highlands to reveal stunning wide vistas. 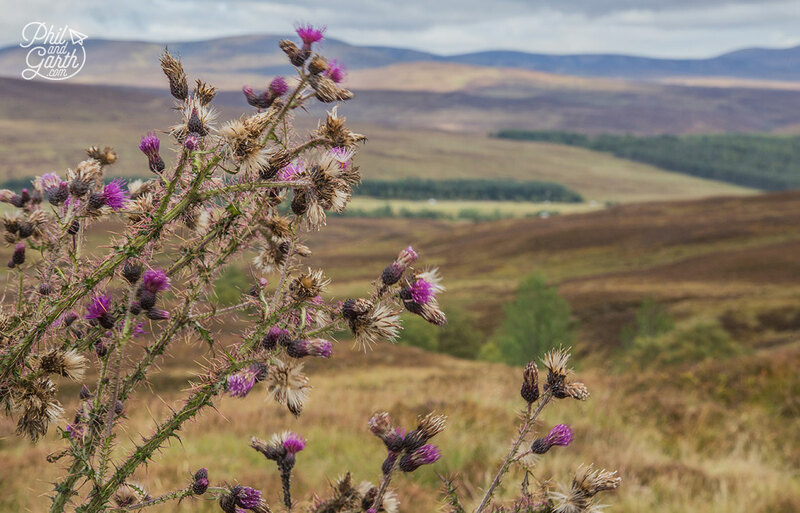 We went in September when the landscape appears more brown but the perfect time to see it covered with iconic Scottish plants – wild flowering purple heather and purple thistles, we stopped lots of times to take photos. The Scottish thistle has been the country’s national emblem since 1249. 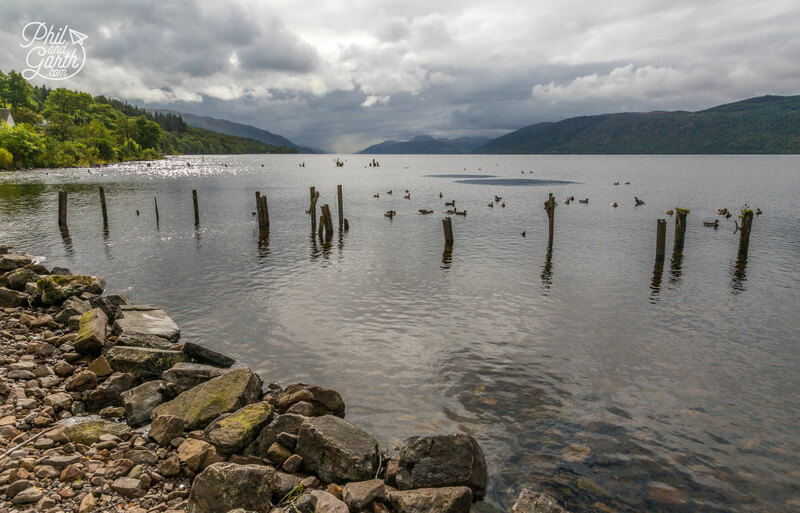 Loch Ness is easily the most famous loch in the Scottish Highlands because of Nessie, the legendary and mysterious Loch Ness monster. 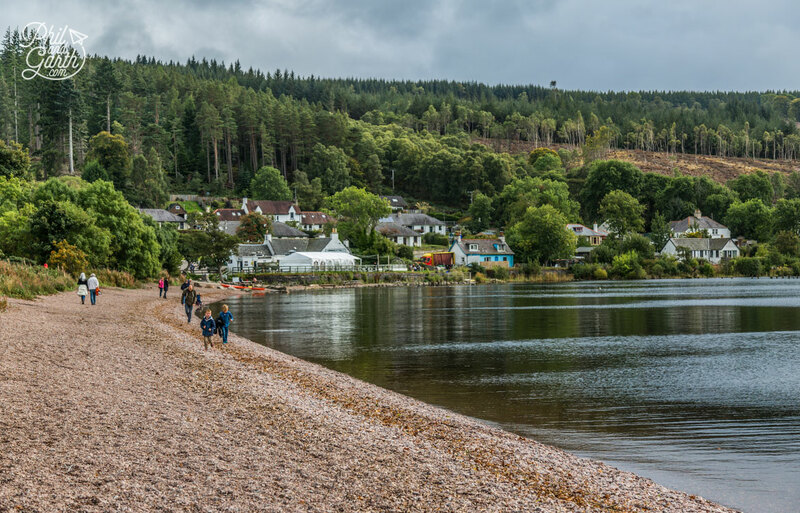 We headed straight to The Dores Inn for a late lunch, it’s an historic pub which offers fantastic views of Loch Ness because it’s right on the shore of the quieter east side. The beach here is one of the most popular spots for photographers, we took our shots and then did some water stone skimming and sat on the beach for a bit of Nessie spotting. If you want to get out there on the water then there’s plenty of boat cruises on offer. Urquhart Castle on the shore of Loch Ness, the visitor centre explains the castle’s turbulent past. 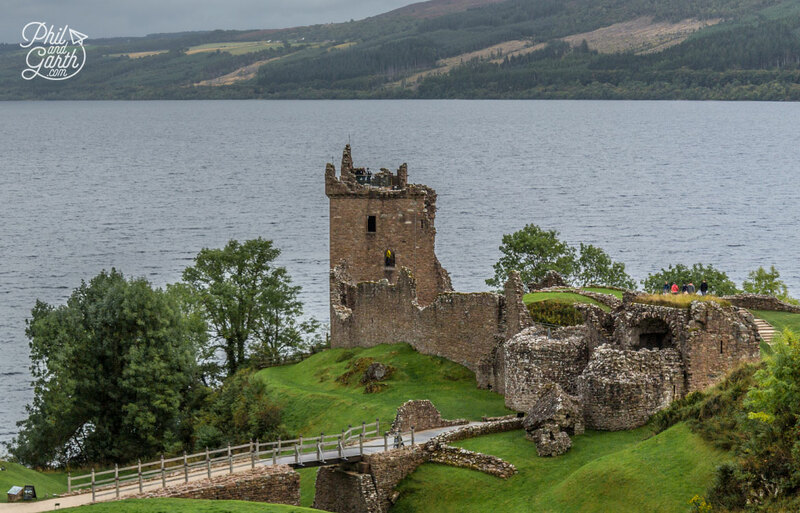 On the other side of the loch are the ruins of one of Scotland’s great castles, Urquhart Castle and the Loch Ness Centre and Exhibition where 7 themed spaces and videos take you through the history of Loch Ness. It’s done quite seriously with scientific details of what can and can’t survive in the water given the temperature and wildlife in the water. 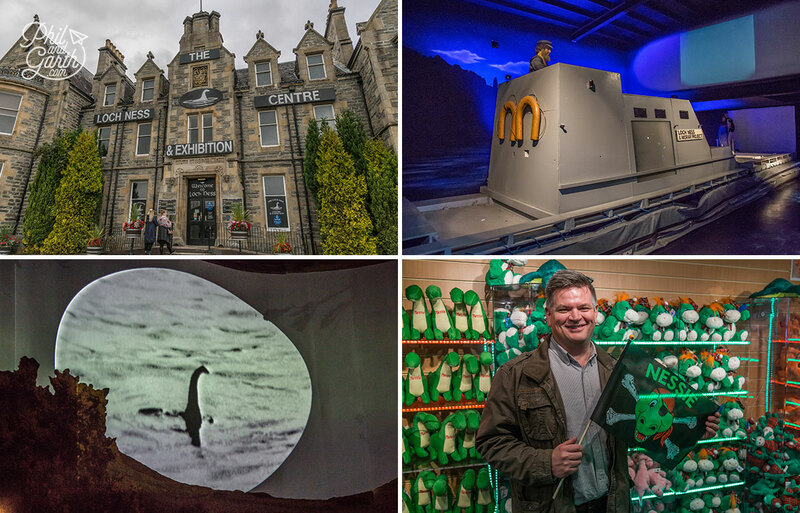 The exhibition examines fake news and photos plus those yet to be decided upon and also scrutinises stories and eye witness statements mystery behind The Loch Ness monster. It’s left up to you to decide if Nessie in whatever form lives in the Loch. Of course you exit through a massive gift shop and when we say massive we mean massive! Does Nessie exists? Of course she does. We saw her, we really did. she’s green, fluffy has two humps. How can we be so sure? Well she was for sale in the gift shop for £13.99! Our B&B for the night was located right on the Loch, which was great as it meant we could maximise our time here. Loch Ness might be the most famous lake, but we felt there are certainly more impressive loch views elsewhere in the Highlands. 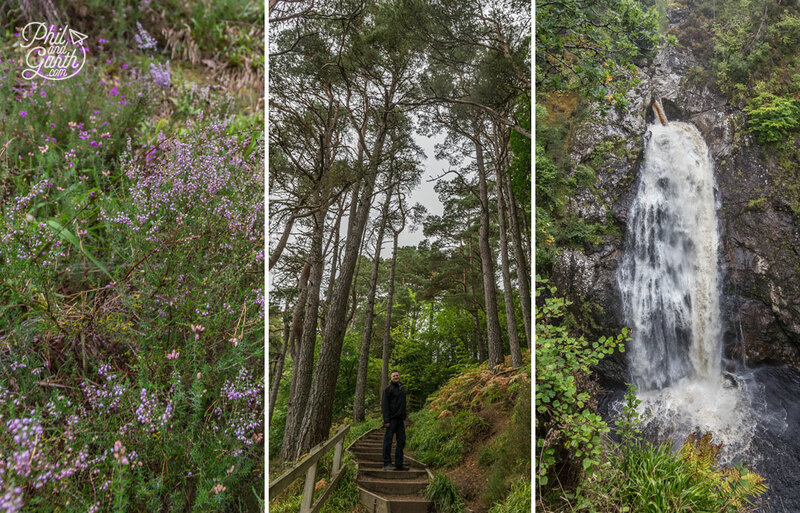 An early morning start and after another haggis breakfast we walked it off by hiking the steep descent to see The Falls of Foyers, which was right next to our B&B. 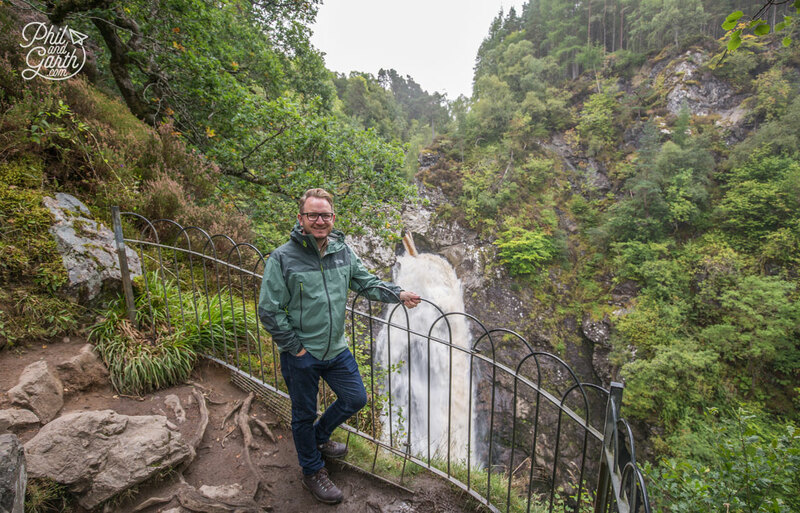 The Foyer Waterfall is located in a dramatic gorge and cascades 140 feet down and is where the water feeds into Loch Ness. The walk is steep and quite precarious in places, just remember you have to come back up! If you want to get here by car head down the B852 to Foyers and park outside the Foyers General Store & Post Office. After the workout back up the hill we jumped back in the car and headed to some more spectacular water falls at Rogie Falls, just over an hour from the Falls of Foyer. 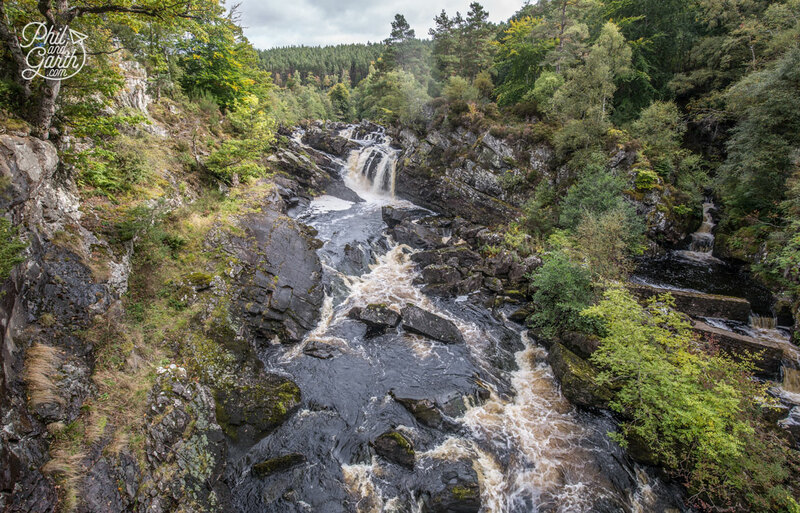 Rogie Falls is one of the best places in Scotland to see salmon ‘run’. From July to September there’s a good chance you can witness wild salmon leaping upstream to find a mate and lay their eggs, sadly we were too late in September so must have missed them. Apparently after heavy rain you have the best chance to see them. Back on the NC500 route and there’s a couple of choices on the way to the Northern town of Wick. About an hour from Rogie Falls is Dunrobin Castle, a French style chateau described as one of the greatest castles in Scotland or there’s the Glenmorangie Distillery. We chose the distillery which turned out to be one of our favorite tours. The Glenmorangie Distillery orange stills and various bottles of whiskies. 1. Malting – barley is germinated in water where the grain turns to malt and then dried in a kiln fired by peat to flavour the malt. 2. Mashing – the malted grains are then crushed with hot water in the ‘mash tub’, the sugar produced is liquid and collected, it’s called the ”wort’. 3. Fermentation – the wort is put inside a fermentation tank where yeast is added. After 2-3 days the sugar has been converted to alcohol, the liquid is called the ‘wash’ and is 8-9% alcohol by volume. 4. Distillation – the wash is distilled twice in copper stills and produces alcohol about 70% by volume. The shape of the still affects the character of the whisky. 5. Spirit safe – the alcohol produced goes into the spirit safe, to allow the stillman to check the quality and strength. 6. 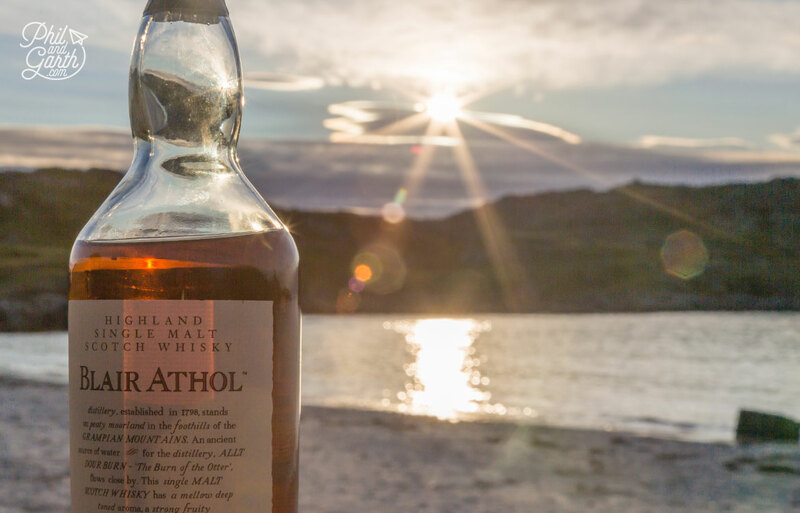 Maturation – the spirit is poured into oak casks where it matures and the colour changes, it requires at least 3 years to even be called whisky, most distilleries mature for much longer. At the Glenmorangie distillery they use second hand barrels from the Bourbon industry in USA and age their spirits for at least 10 years. Glenmorangie use them only twice as after that the charcoal inside is all used up and they are like virgin barells again, these barrells are then sold onto the mixed malt whisky industry. 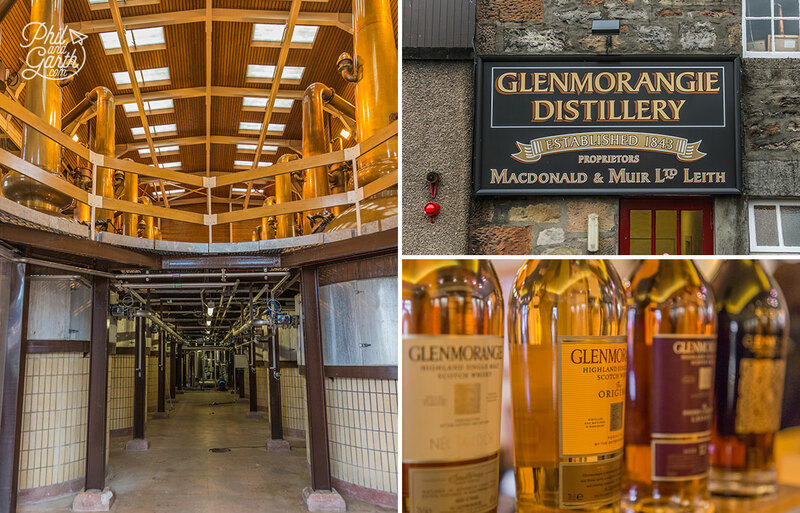 At the end of the tour we sampled all the variations of Glenmorangie, the whisky matured in ex-sherry barrels was easily our favourite because it was sweeter, we bought a bottle from the gift shop – and no we didn’t buy a giraffe! On this tour and all the whisky tours we did they give the designated driver whisky samples in small test tubes to try later, so Garth didn’t miss out! Back on the road and it’s a 1h 30m drive to our final stop of the day – Wick. The landscape on this coastal road changes dramatically – it becomes sparse and bleak. We wanted to see the Whalgoie Steps before the daylight went, so we headed straight there instead of our B&B. 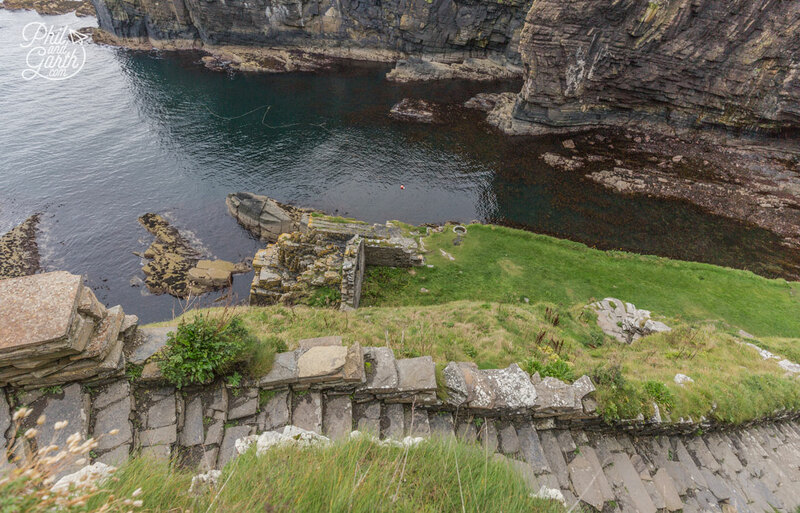 The Whaligoe Steps – 365 steps that descend to an old naturally formed harbour between two sea cliffs. 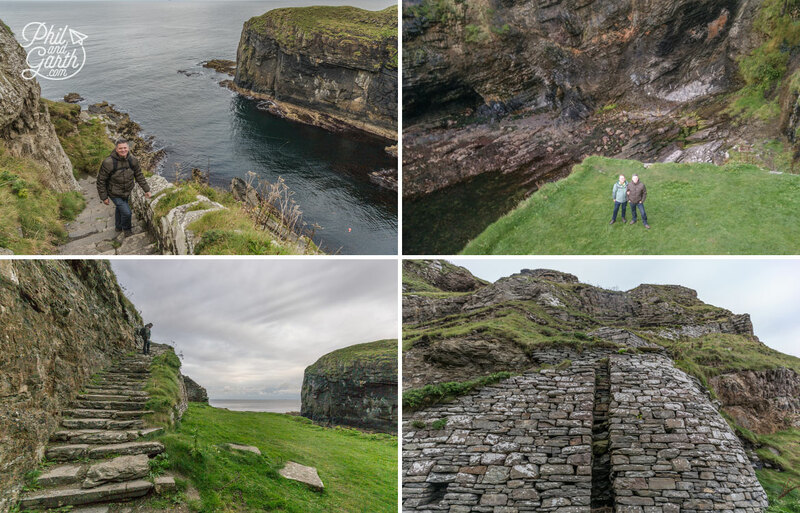 The Whaligoe Steps are right off the beaten path, but worth finding. The 365 steps built in 1792 lead to an old natural harbour set against high and dramatic cliffs. In the mid 1800s this place was thriving with fishing boats. At the bottom of the steps is a flat area called ‘the bink’ it has the remains of the old salt store, where Phil found a geocache accidentally in the wall, so signed the book and left a gift. You can also see the round pit where oil and cow urine was boiled to make a tar that fishing nets were soaked in to preserve them. Also look for holes in walls that were used for oil lamps so workers could work in dark and a long slot in the brickwork where poles were placed to support fishing nets for drying. 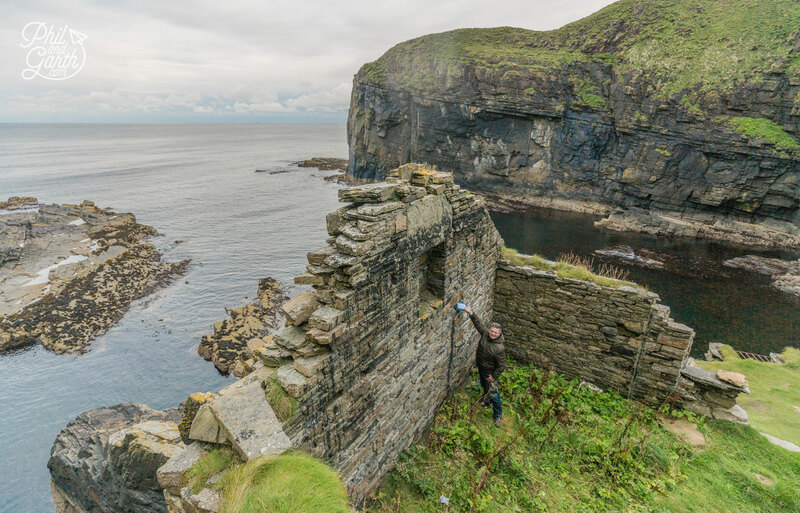 Local women would gut the fish and then carry the fish up the 365 steps in buckets on their backs and walk 8 miles to nearby Wick to sell the fish, must have been very gruelling work. We met a chap near the top of the steps who looks after them, his grandfather was a fisherman there. He showed us a great photograph of the harbour full of fishermen and boats back in the day, and said it was probably named after beached whales that would wash up in the harbour. To get here is a little tricky and took us a few attempts, look for a crossroad just south of Ubster on the A99 that leads to a dead-end road, make your way past the Whaligoe Steps Cafe and you’ll find the steps. Our B&B not far from the Whaligoe Steps was easily our favourite stay in the Scottish Highlands. 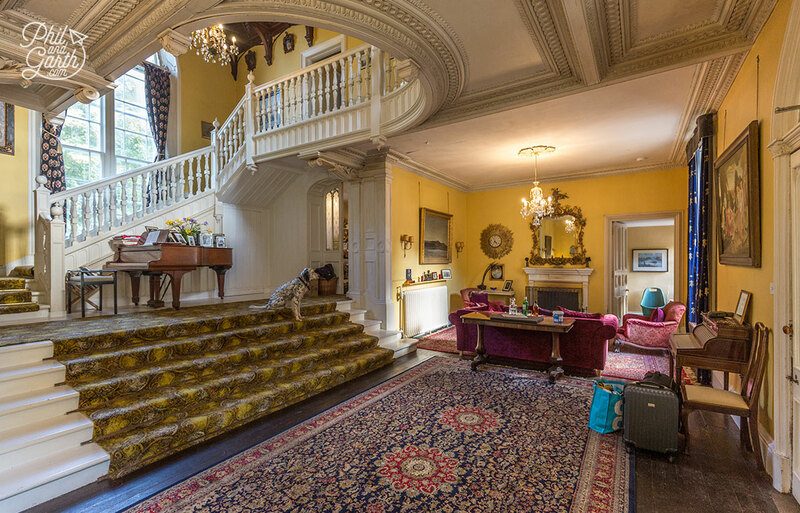 A beautiful country mansion, bursting with character and charming hosts with a hearty homecooked breeakfast to die for! 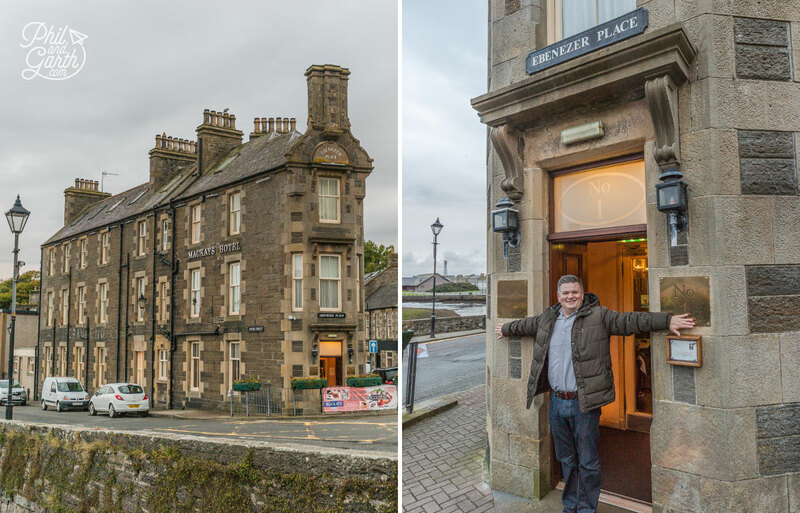 After a quick freshen-up we took the short drive to Wick for some dinner, be sure to check out Ebenezer Place – the world’s shortest street! 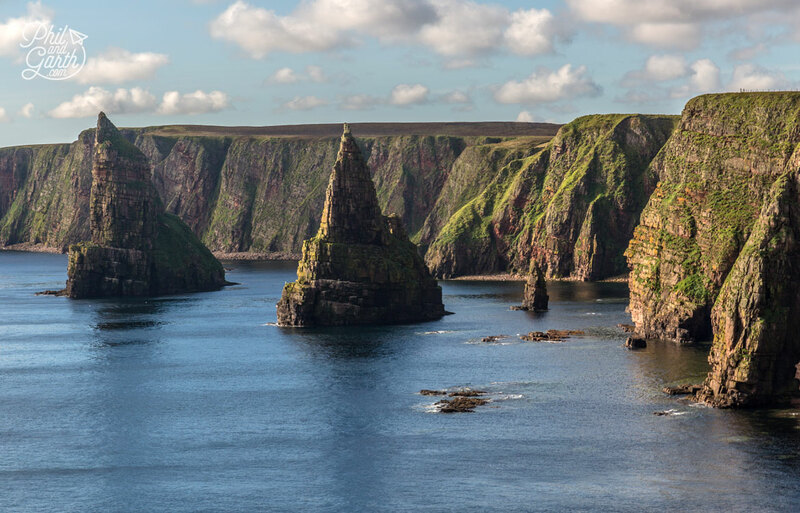 After our amazing breakfast we headed out to our first stop of the day – Duncansby Head, just 30 mimutes away. 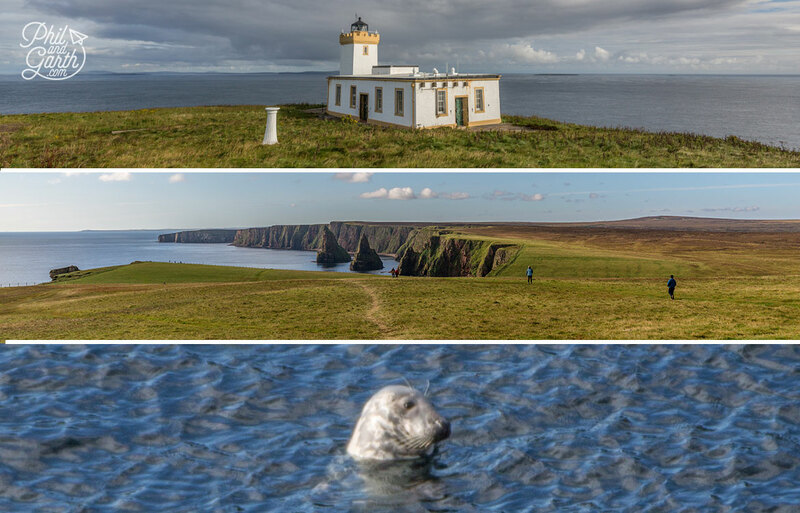 It’s a lovely coastal walk from the lighthouse to the jagged coastline of Duncansby Head. With binoculars and our camera’s long lens in hand we watched the grey seals have fun in the water near to the Duncansby Stacks, it’s a great spot for wildlife watching. A lady we spoke to saw dolphins but sadly but we didn’t, oh and grey seals can be seen at all times of the year. 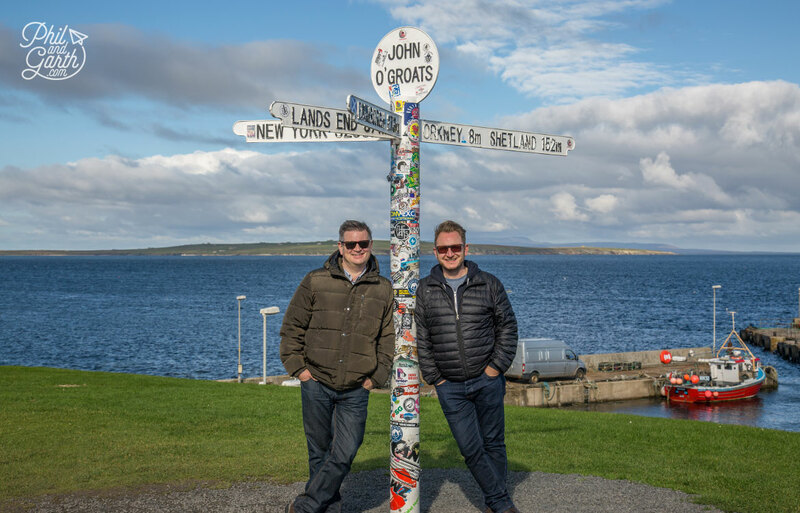 10 minutes from Duncansby Head is Scotland’s famous end of the road village – John O’Groats where we got our photo taken with the famous landmark signpost. 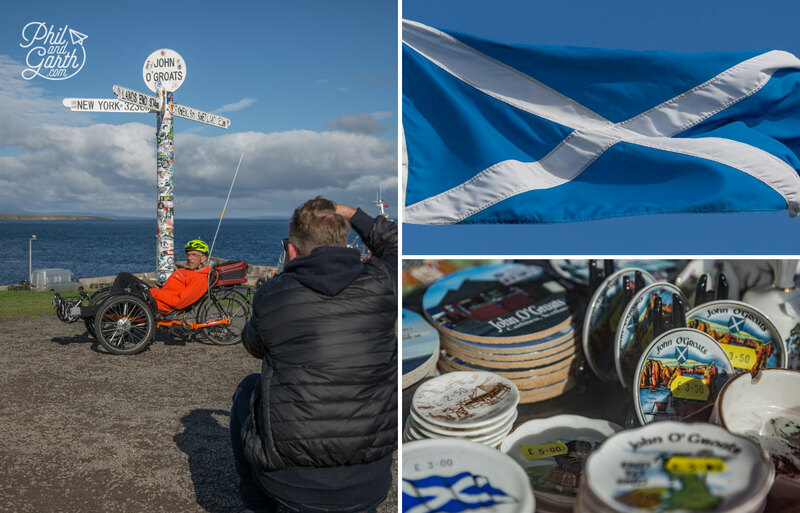 John O’ Groats is not the most northerly point of the UK, as most people assume, as did we until we read all the facts at the visitor centre, it’s actually the end of the longest distance between two inhabited points in the UK, the start being Land’s End, 876 miles away in England. The route is called the ‘End to End’ journey, by chance we realised we’d been following a guy on his recumbent bicycle, then he turned up at the signpost, we spoke to him about his long journey, what an achievement! This being Britain there was no ticker tape parade just a hand shake and a well done! If you’ve been to Land’s End in Cornwall, well John O’Groats is much nicer, there’s no theme park, and you don’t have to pay to have your photo with the signpost. Instead just a lovely harbour backdrop, we had a clear day with great views across to the neighbouring Orkney Islands. 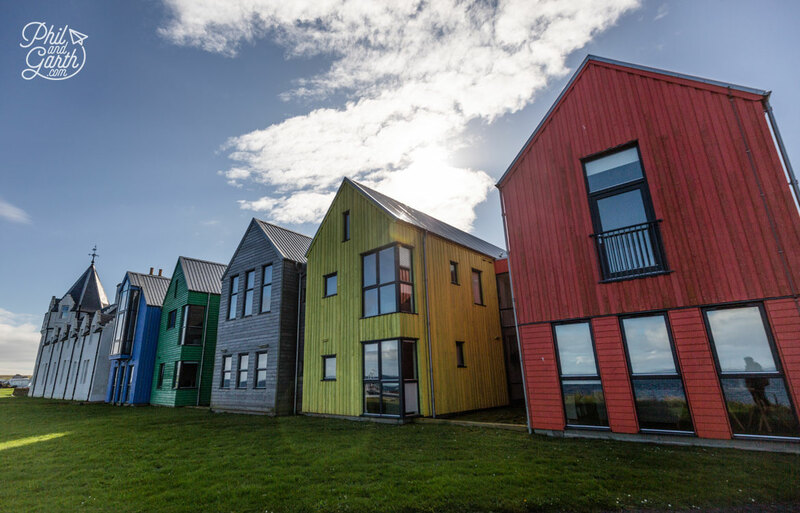 You can get a catamaran to the Orkney Islands from Gill’s Bay, a short drive from John O’Groats. So what is the most northerly point on our island? 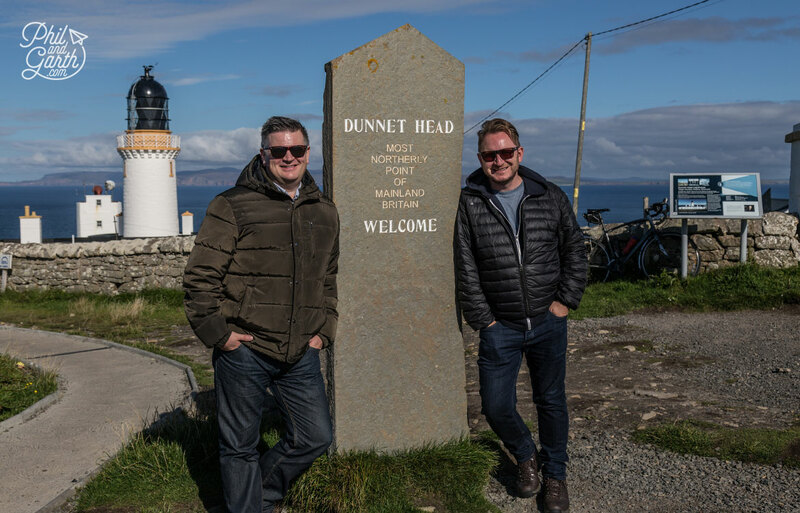 Well it’s Dunnet Head, 26 miles from John O’Groats. 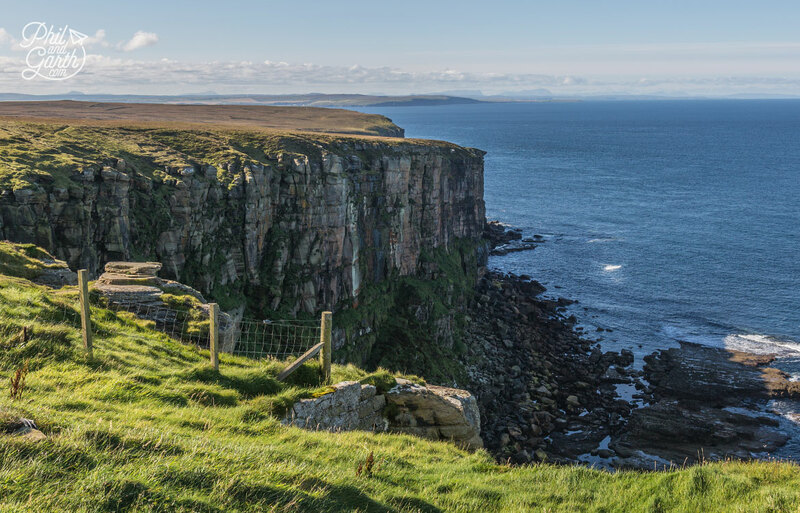 Dunnet Head’s rugged peninsula cliffs attract thousands of breeding sea birds like puffins, razorbills and guillemots, the best time to see them is May – July. We saw a few birds and also loads of fab vintage cars parked next to the lighthouse, they were taking part in “the haggis trail” not sure what that was but an open-top car drive in this region of the Scottish Highlands must be so much fun! Just after leaving Dunnet Head is the town of Thurso, train spotters might want to stop here at the the UK’s most northern railway station. 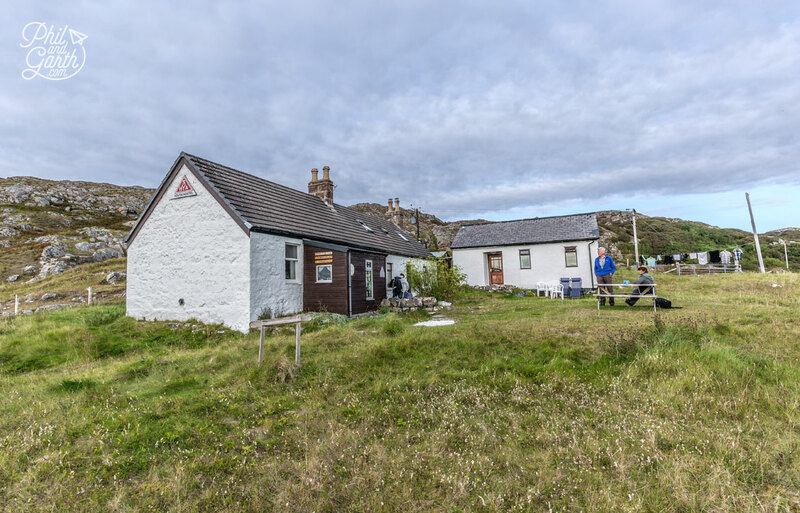 Now it was time to drive the longest part of our NC500 route to our last stop of the day – Achmelvich Bay (3 hours 15 minutes) We thought this part of the whole journey was one of the most dramatic, we loved the natural wilderness of this region. 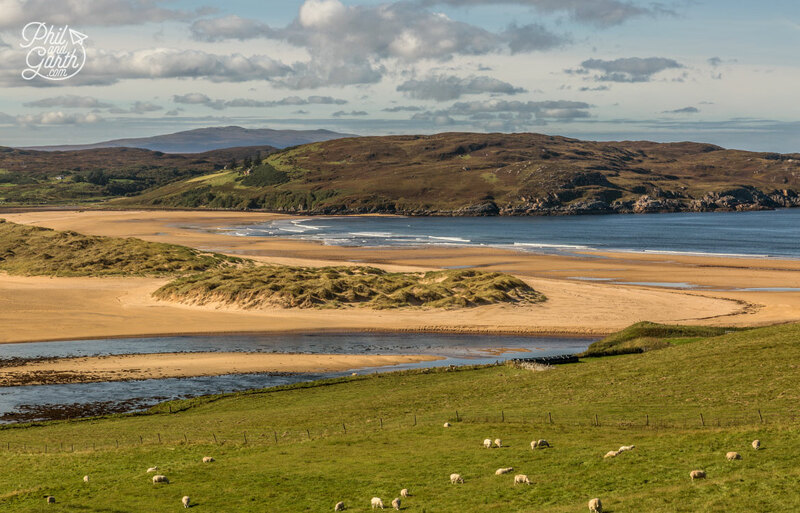 There’s some spectacular scenery to take in like vast empty beaches, just be careful on single track roads of sheep crossing and use the passing places to pass oncoming vehicles. Lots of single track roads with passing places. Slow down when you see sheep! 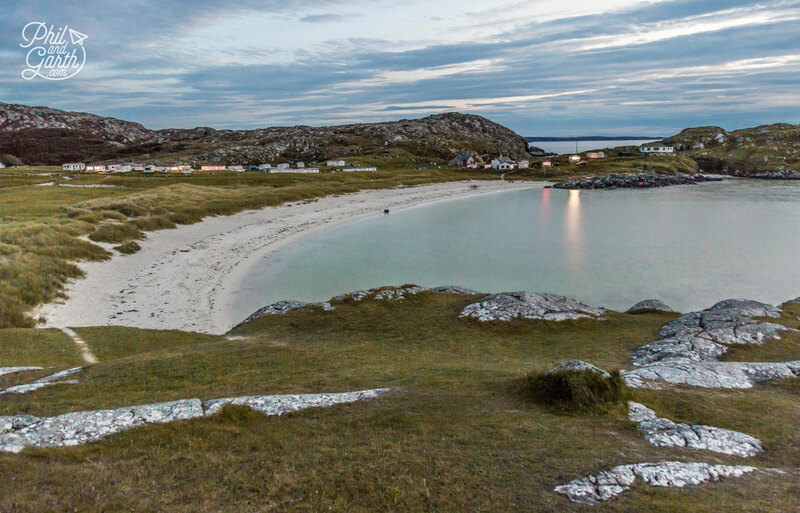 A long single track road takes you to the spectacular white sands of Achmelvich Bay. It looks like a beach straight out of the Caribbean, it’s isolated, unspoilt, it’s perfect. You’ll find a few caravans, a small campsite, plus a YHA youth hostel which was our home for the night. It used to be a school, it was comfortable and very clean. 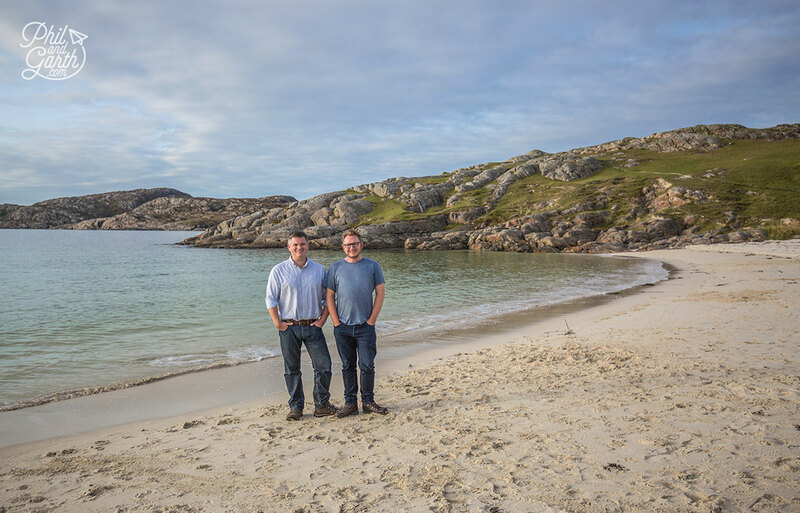 We went exploring this desolate spot, just over the surrounding rocky landscape we discovered another more secluded beach over the hill. Back on our beach we took a Scottish picnic of haggis and chicken pies (an interesting combo), cans of Irn Bru, Scotch eggs and whisky and watched seals in the bay popping up their heads whilst the sun faded away. It was a special moment as we had the beach to ourselves, then a lady joined us, donned a wet suit and went wild swimming with the one remaining seal, it was amazing to see how the seal enjoyed her company. After it went dark we were really hoping the clouds would clear so we could go star gazing, as this part of Scotland has some of the darkest skies in the country, but sadly for us the cloud didn’t part. Next morning we enjoyed another walk on the beach in this magical spot, then the heavens opened and torrential rain!! 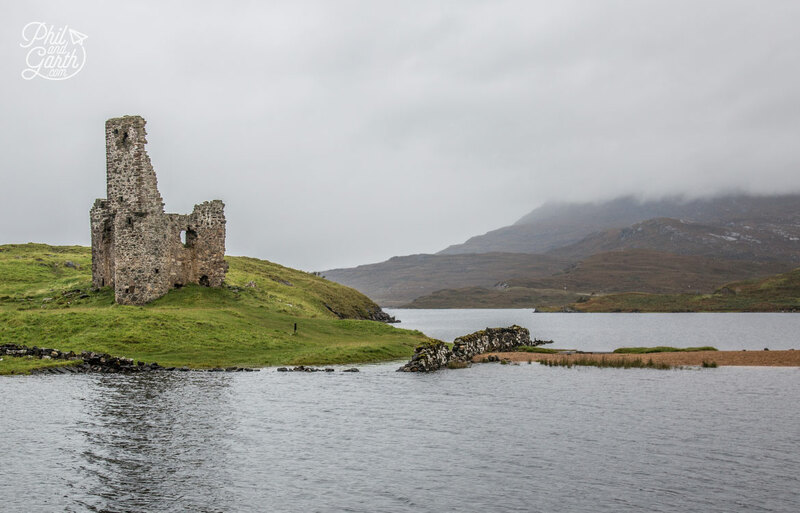 so it was back in the car to visit the nearby Ardvreck Castle on the shore of Loch Assynt. Standing in ruins it dates back to the 16th century, the rain and grey low clouds made it all very moody. 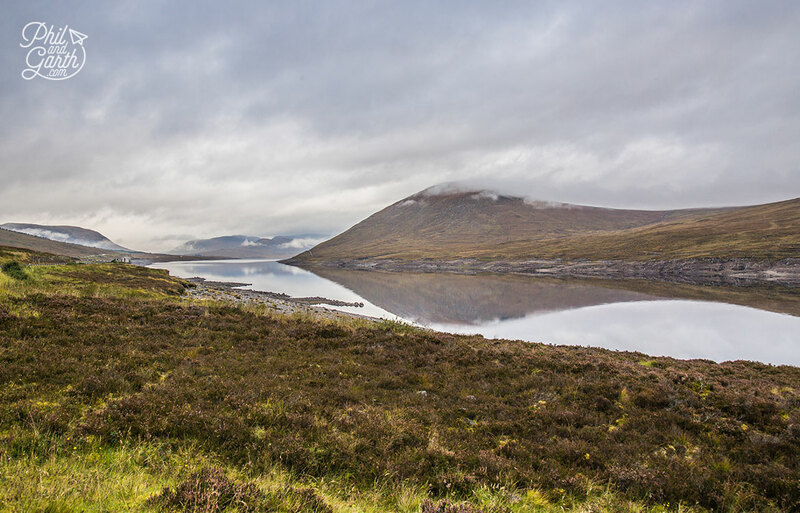 The drive from Loch Assynt to the Isle of Skye takes you pass lots and lots of different lochs along the way, just pull into a dedicated parking area for plenty of photo opportunities. 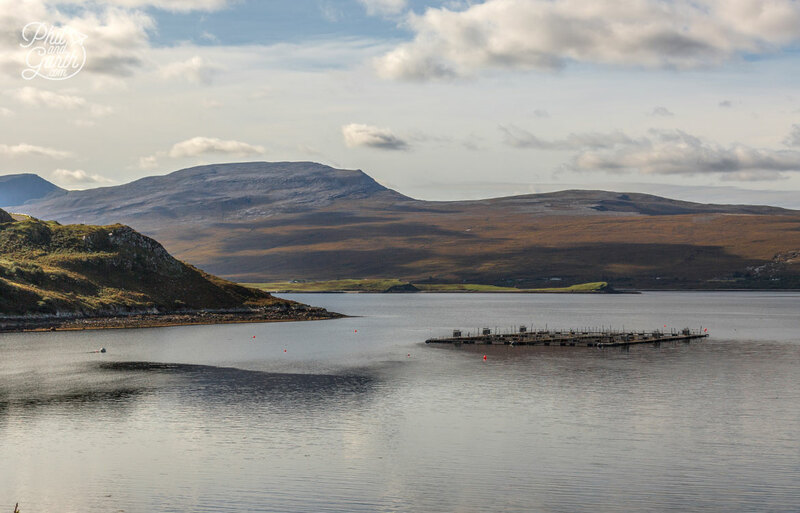 For lunch you could stop at the popular Ullapool which is a pretty town on the shore of Little Loch Broom, but we carried on to the Torrindon Inn pub in Torrindon, it’s a lovely spot where the surrounding fields were full of Highland coos and well worth a walk to the nearby loch. Back onto the road, the weather was still very poor, the water was now pouring down the mountains onto the roads, so we had to take extra care driving. 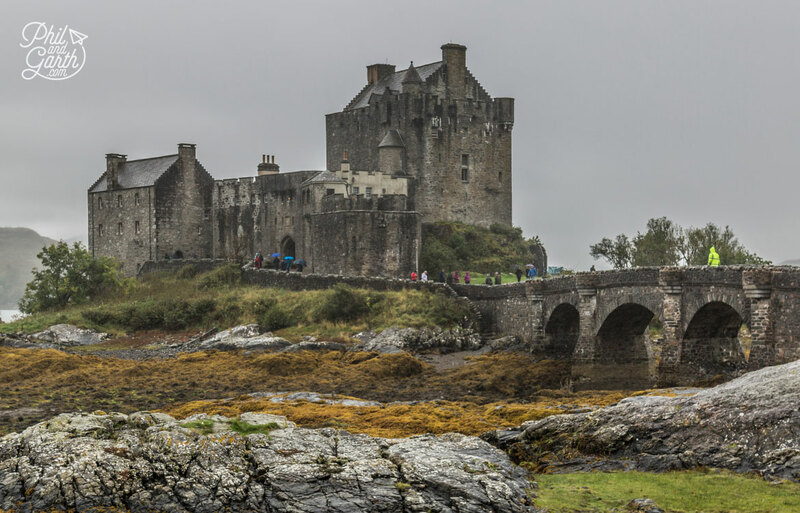 Before crossing the bridge over to the Isle of Skye, our next stop was Eilean Donan Castle. 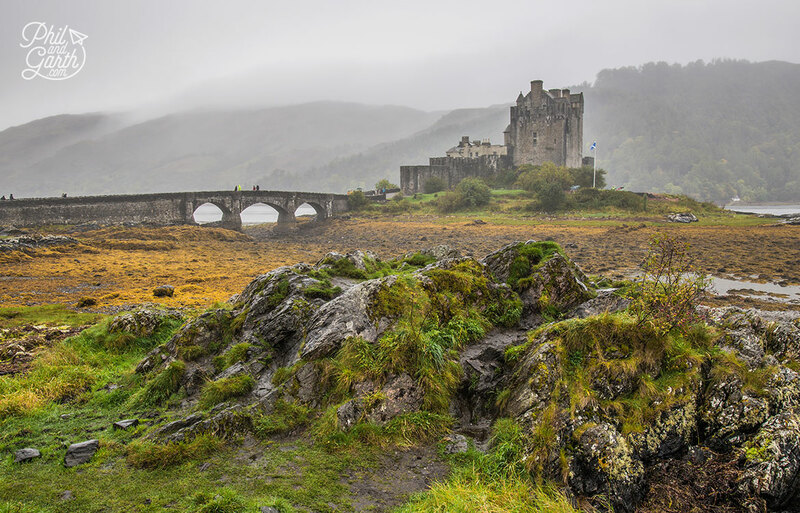 Located on the junction of three lochs it’s stunning, easily one of Scotland’s most iconic and beautiful castles. But this means bucket loads of tourists all year round, so be prepared for that. Eilean Donan Castle was made famous on the bigscreen in the movie Highlander, it also featured in the old BBC One balloon tv idents. The moody skies on our cloudy day certainly made it look atmospheric, but by now we were getting a bit bored of the rain and being so wet! Another Scottish icon, the Highland Coo, we love their long and wavy wooly coat! Leaving the Isle of Skye behind, day 6 was a long day of driving, but with loads of exciting stops. First up we drove to Spean Bridge to visit the striking Commando Memorial with views of Ben Nevis (the UK’s highest mountain) in the background. 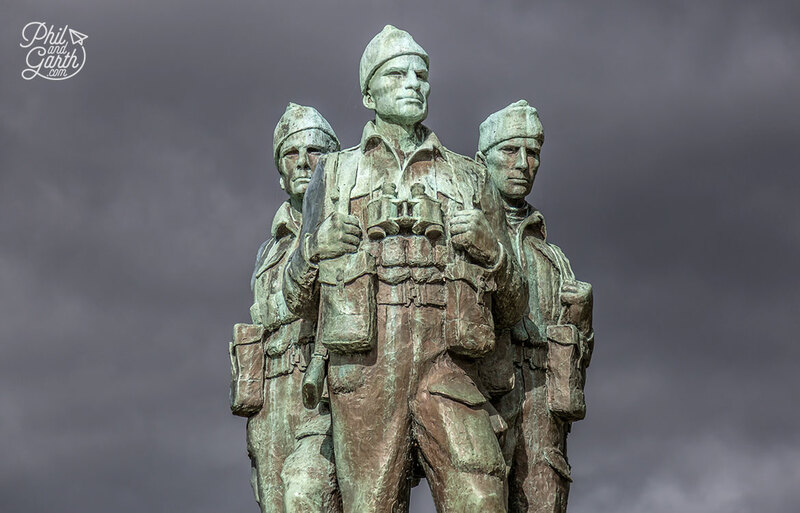 The war memorial is dedicated to the British Commandos, an elite force formed during World War 2 who carried out bold raids against German occupied Europe. 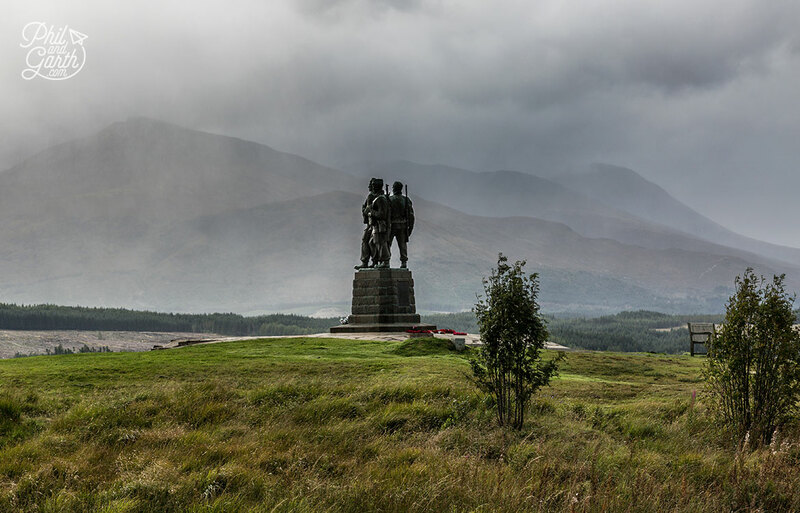 They were the toughest and bravest soldiers picked from various regiments and ruthlessly trained in this region of the Highlands – Lochaber which the statue overlooks. Next to the statue is a small memorial garden, used by families of modern day commando units who place the ashes those who’ve died in recent conflicts such as Iraq and Afganistan, Phil says it was quite moving reading tributes and seeing their photos. Back on the road and a 35 minute drive is the Glenfinnan Railway station. 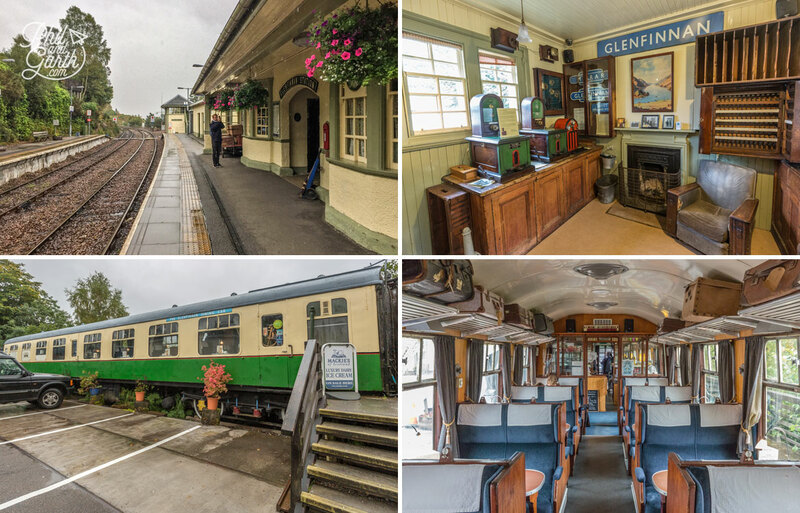 We stopped here for some lunch in their converted railway carriage, the small station also has a tiny museum, which train buffs will love, but our main purpose was to hike to the best viewpoint to see the Glenfinnan Viaduct, made famous in four of the Harry Potter movies, it also features on the Scottish £10 banknote. The walk to the classic viewpoint takes around 30 minutes we witnessed some great views over Loch Shiel as you walk along the path through all the waist high ferns. Our anticipation built as we waited to catch our first glimpse of the famous viaduct. When we did, we were surprised to find lots of other people with the same idea all looking for the best spot to pitch themselves, we found ours and waited, waited and waited some more. 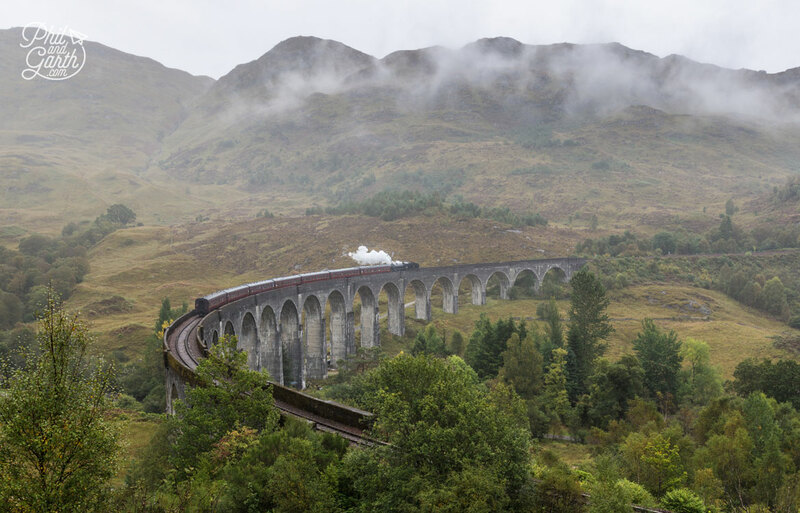 Be prepared for this one, it’s an event, as timing is critical if you want to see the famous Jacobite Steam Train passing over, ask at the train station for the schedule before taking the walk. It’s usually once in the morning 10am and again in the afternoon around 3pm and they run from May to October. Be prepared for the wait – take coffee and cake, we waited around an hour and a half. 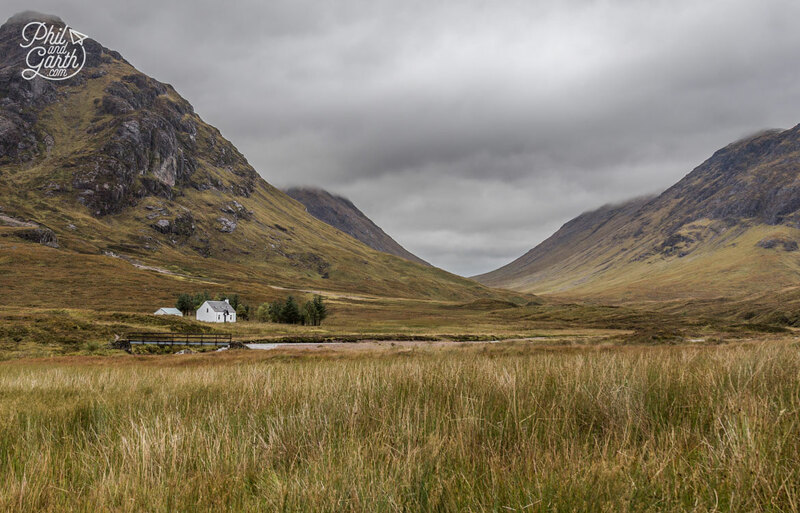 If we had to choose our favourite part of our Scottish Highlands road trip, then it would have to be Glen Coe as the drive and views through this spectacular valley are just epic. It’s popular with mountaineering groups and hikers, that’s not us so we used the various roadside viewpoints to pull off and admire the panoramic views, our first one was the Three Sisters viewpoint. 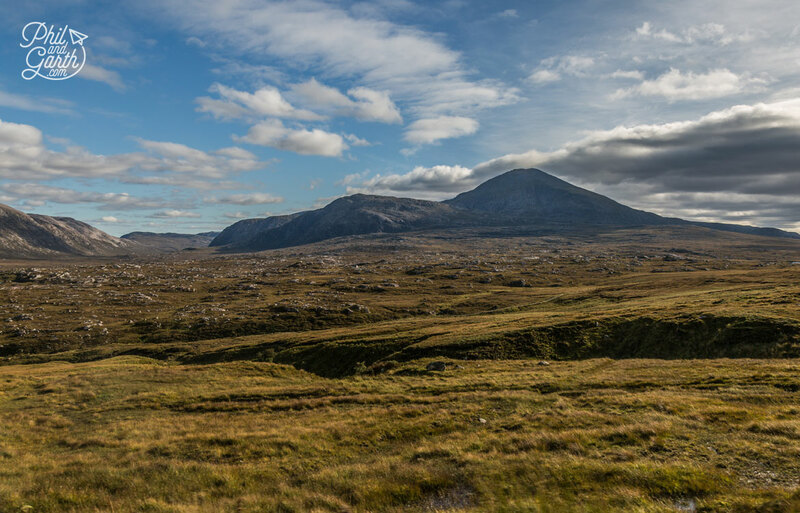 The Scottish Highlands easily has the most dramatic scenery in the UK! The colours and dramatic peaks of the mountans in Glen Coe reminded us of South Iceland. Worth noting that in remote areas like this there’s no internet access on your phone, so Google Maps won’t work unless you’ve downloaded them beforehand, our sat-nav worked a treat for the whole road trip. 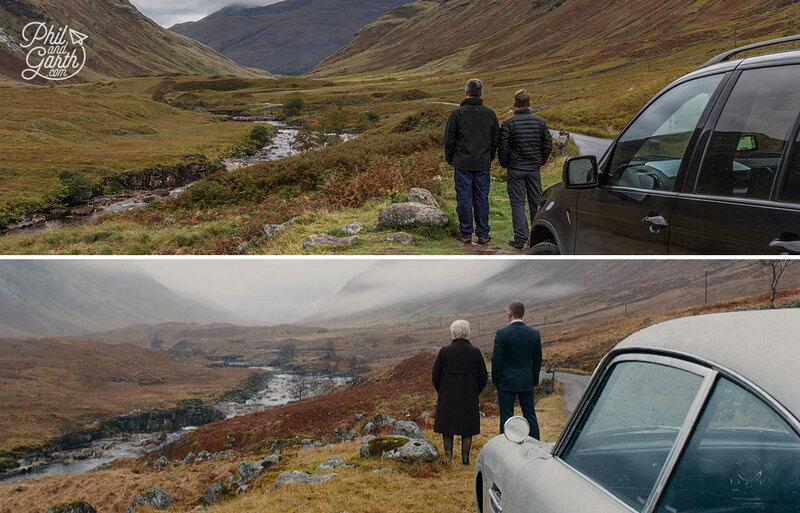 Glen Coe and Glen Etive featured in James Bond’s Skyfall, the driving shots are taken on the only main road through Glen Coe, whilst the famous scene with 007 and M is on the smaller road that follows the River Glen through Glen Etive, the exact location is fairly easy to find and we had a go at recreating it! Skyfall Phil and Garth style! 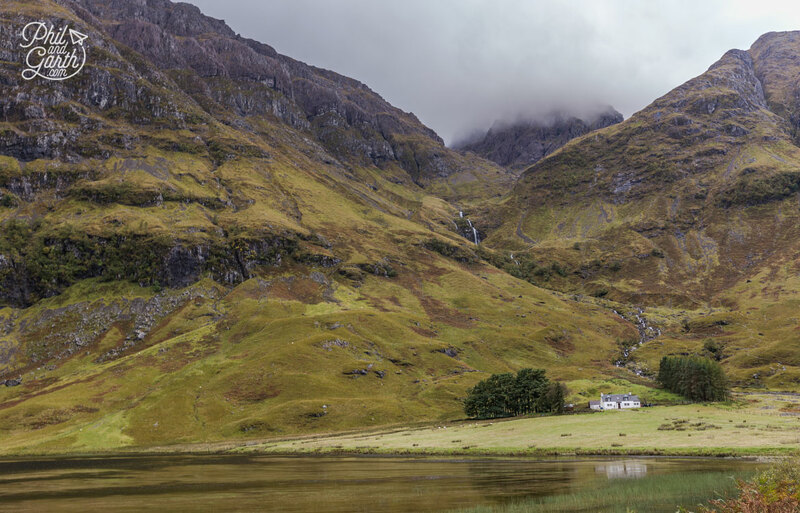 Our favourite part of the Scottish Highlands, just breathtaking scenery. Time to hit the road again as it was getting dark, a 50 minute drive to Oban. 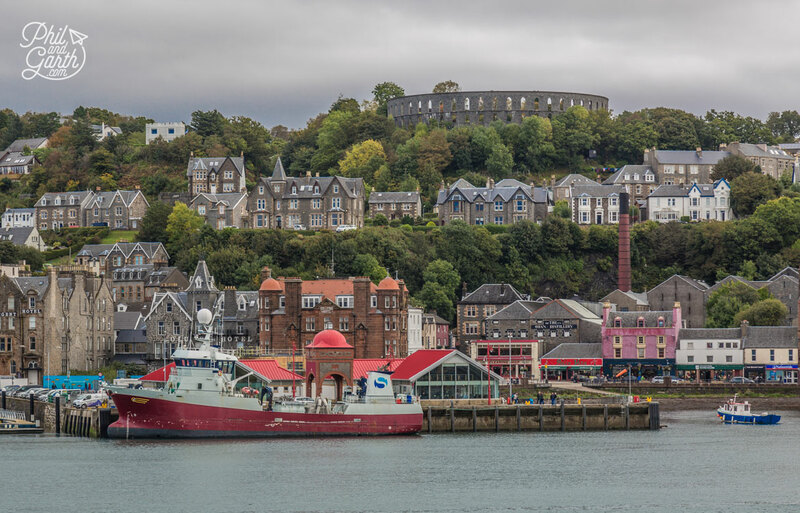 Oban was the final destination of our Scottish Highlands road trip, ok we’re cheating a bit as Oban is not officially in the Highlands, but it’s pretty close. 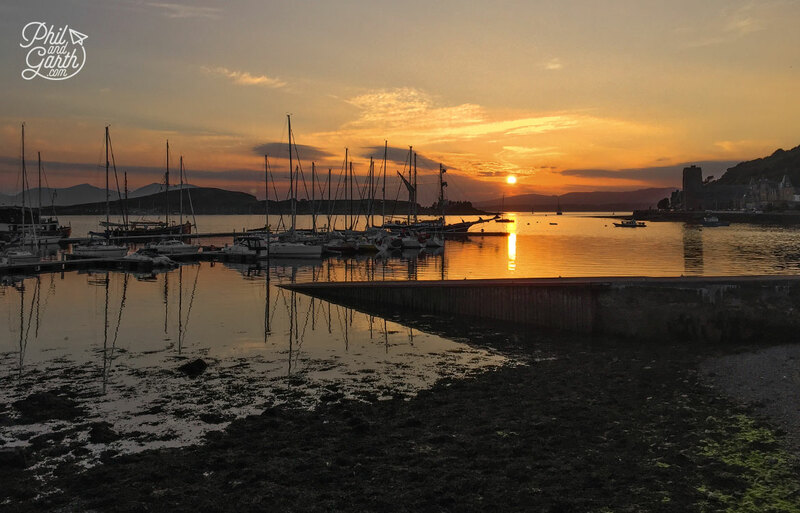 It’s perfectly compact and known as the “Gateway to the Isles” because of the easy access to the Outer and Inner Hebrides by ferry, an Isle of Mull day trip is really popular with visitors to Oban. 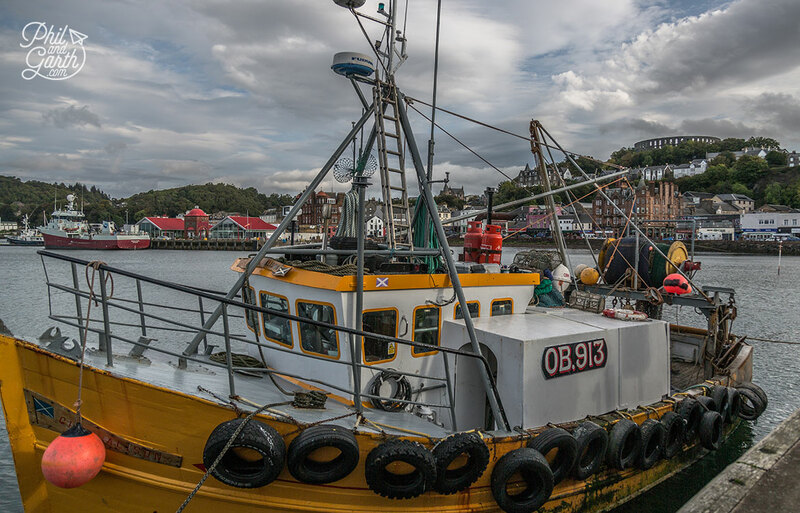 Oban means “Little Bay” in the Gaelic language. 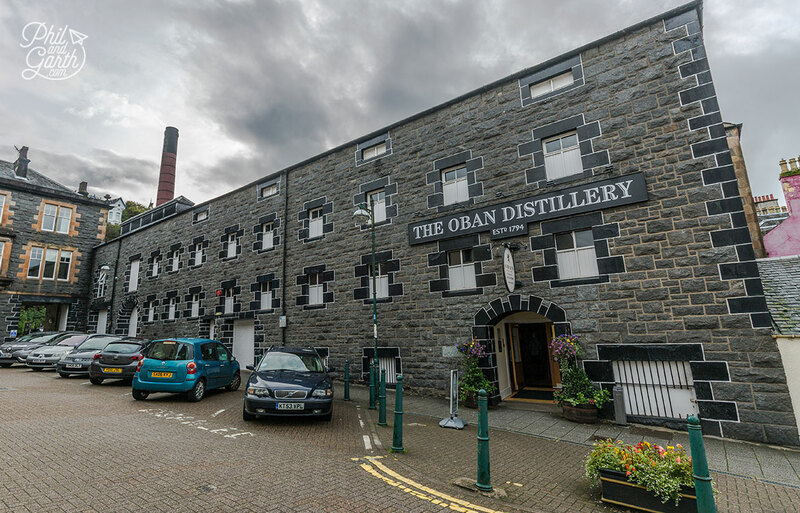 Oban has its own whisky distillery, so we decided to do another tour! Ann our tour guide was great fun and showed us the steps in their production process before heading to the barrel store for the main event – sampling the Oban single malt. Another surprise was we got to keep the sampling glasses, what a great souvenir of our road trip. 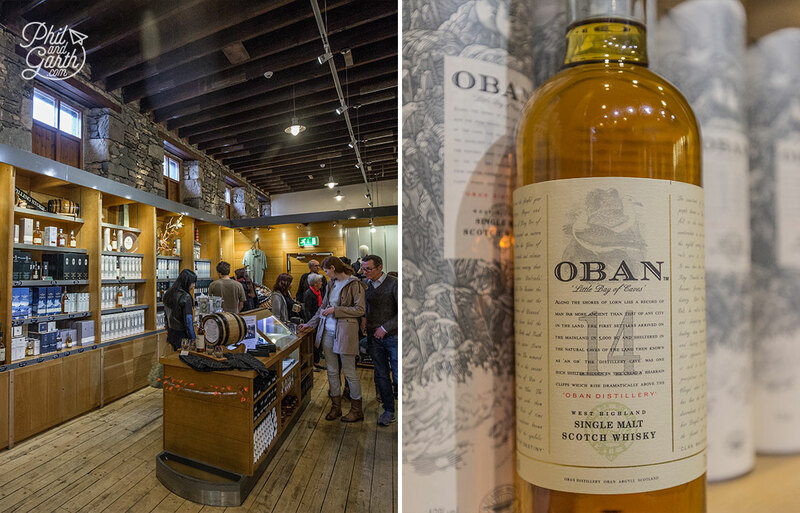 The Oban single malt has a subtle smoky flavour we could also taste orange and honey, Ann said we should be able to taste sea-salt, but we couldn’t. She also said we should try it with scallops or crystallised ginger. Another tip was to try a strong smoked single malt with smoked salmon. 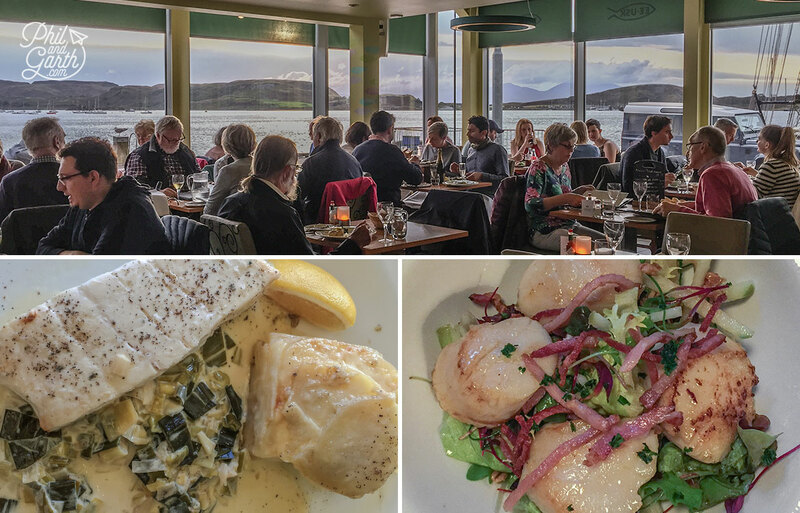 Oban’s location right on the waters of the Firth of Lorn means it’s seafood heaven! 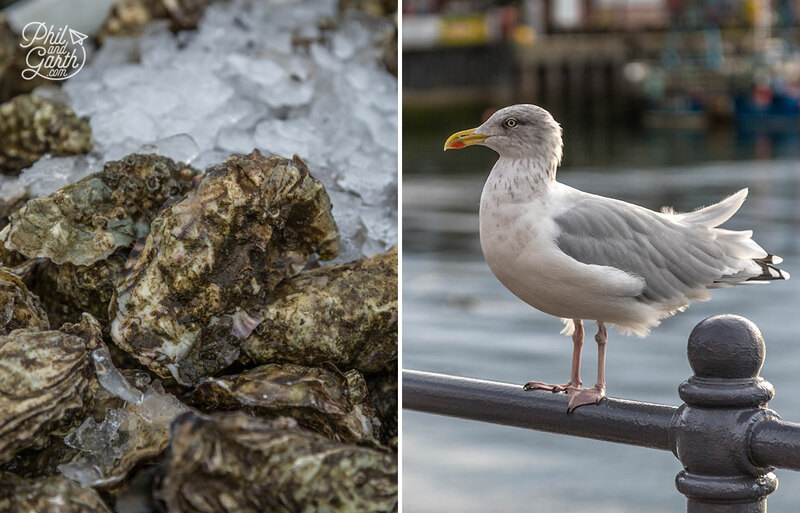 There’s award winning restaurants to choose from or cheap ‘n cheerful oyster bars in the harbour proudly displaying banners, “Seafood Capital of Scotland”. We loved Ee-usk, a contemporary restaurant with a great atmosphere and lovely views of the bay serving up simple, fresh and delicious dishes. 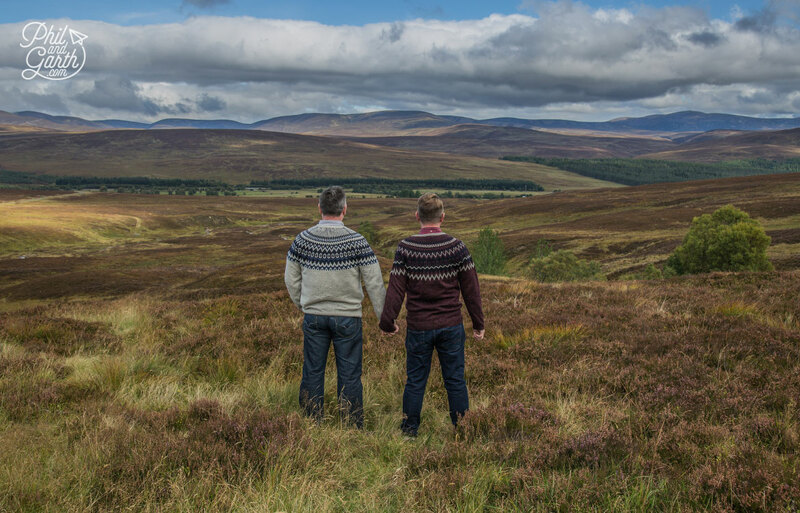 It was a brilliant place to reflect on the highs and lows of our Highlands road trip. 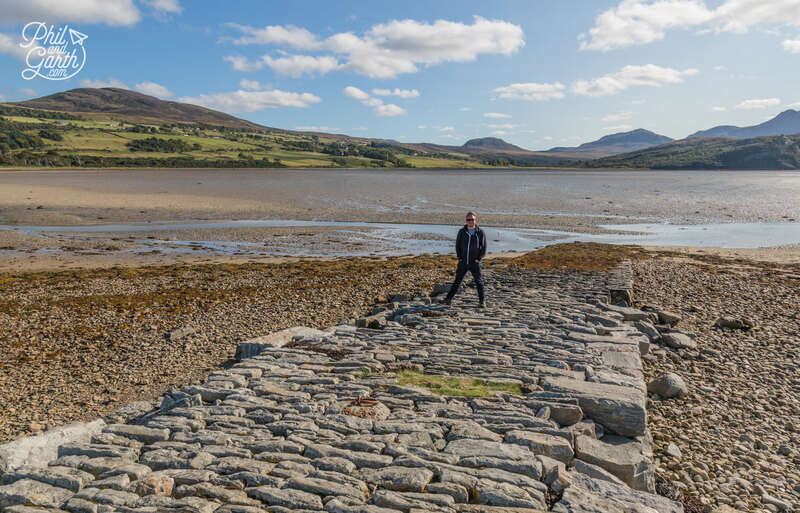 Tip #1: Book your distillery tours in advance, or you could face a long wait on arrival. Tip #2: Get up early and go to bed early to make the most of the day, as there’s a lot of driving. 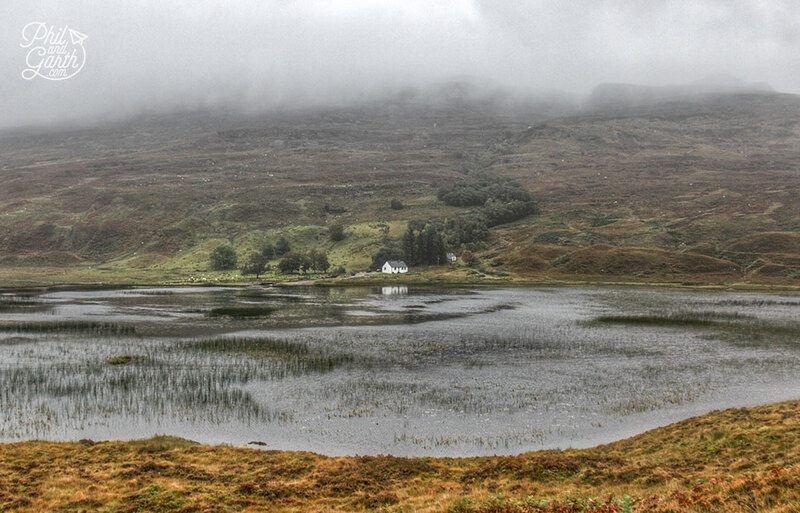 Tip #3: Midges are a real issue in the summer, we went in September – so not a problem. Tip #4: Book accommodation well in advance. Tip #5: July & August are the peak months – probably best avoided. 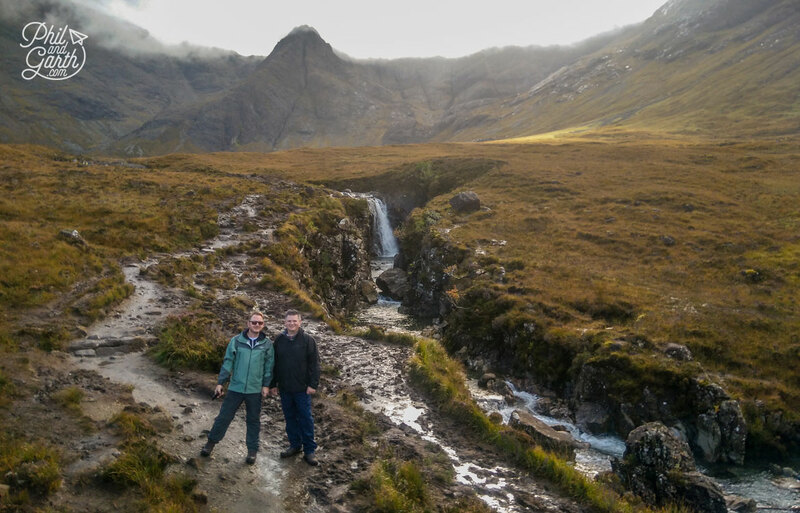 Click here for our interactive Google Map to view our complete Highlands of Scotland itinerary including the Isle of Skye. Wow! Stunning photos. We are heading to Europe in April. I certainly hope we get to Scotland. Thank you for this awesome information. 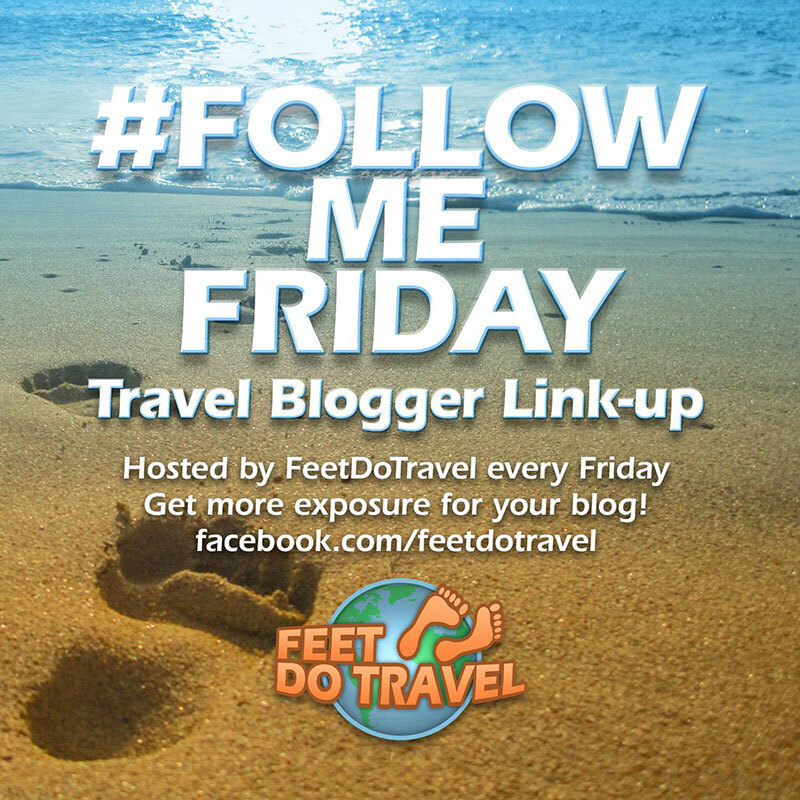 Wow — this would be a dream trip for me! 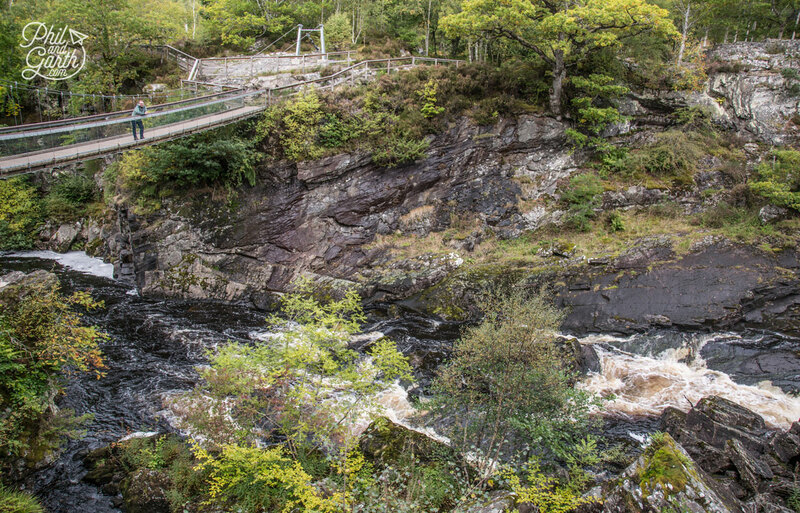 Those waterfalls, and also the shores of Loch Ness. That’s always been a “mythical” place in my mind. It’s actually quite charming. The BnB in Wick is also the perfect place in my thinking, complete with a pup. You had me at your first wee dram. What a fabulous week and no huge distances allowing some time for whiskey tours. LOL. I’m definitely planning this trip and will follow your advice. I must mention, I love the video you always start your posts with. It gives a fantastic overview of what to expect. I’ve pinned this for later. I’m with Garth on sticking with the veggie haggis. Ahem. 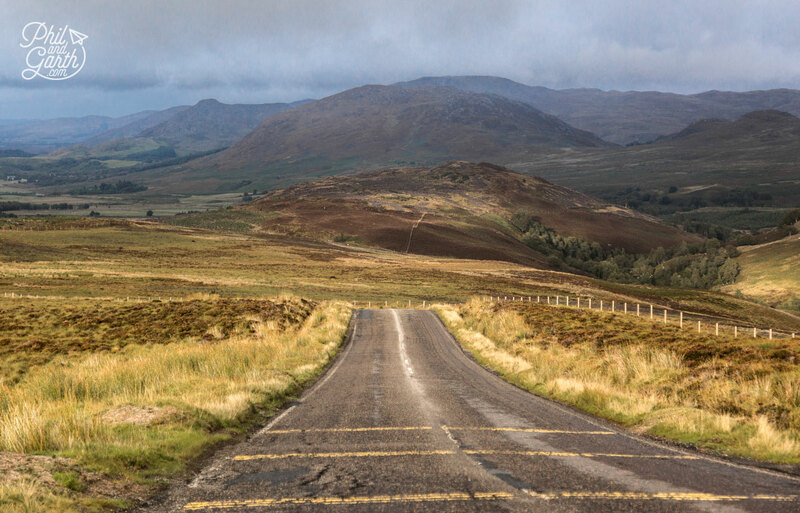 I would absolutely LOVE to take this road trip–the Scottish Highlands have long been one of my dream destinations, and your photos of the dramatic scenery are breathtaking. Thanks for sharing your itinerary. 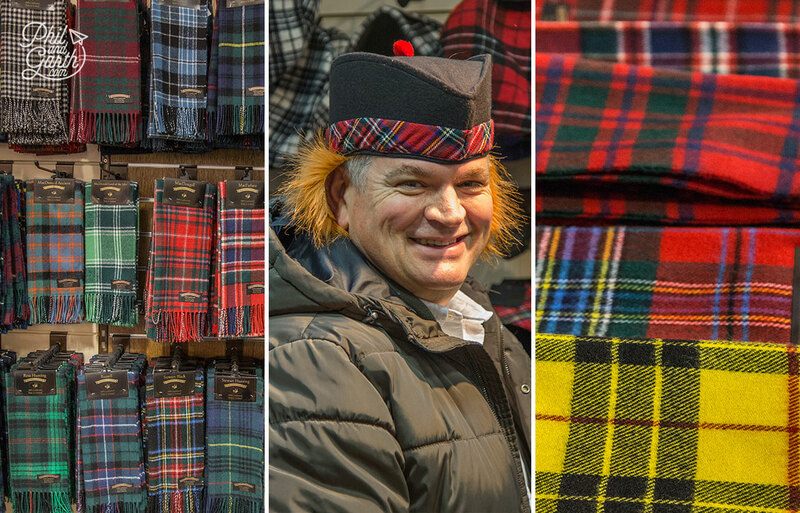 This post is perfect – we are headed to Scotland later this year! 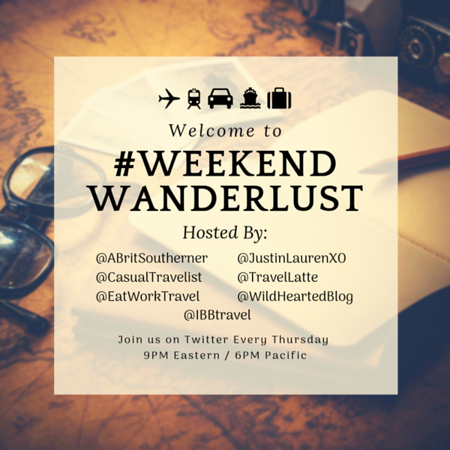 We are hoping to hit some of these great spots, you featured them beautifully. I noticed you were in September but are still wearing big puffer coats. Was it cold? 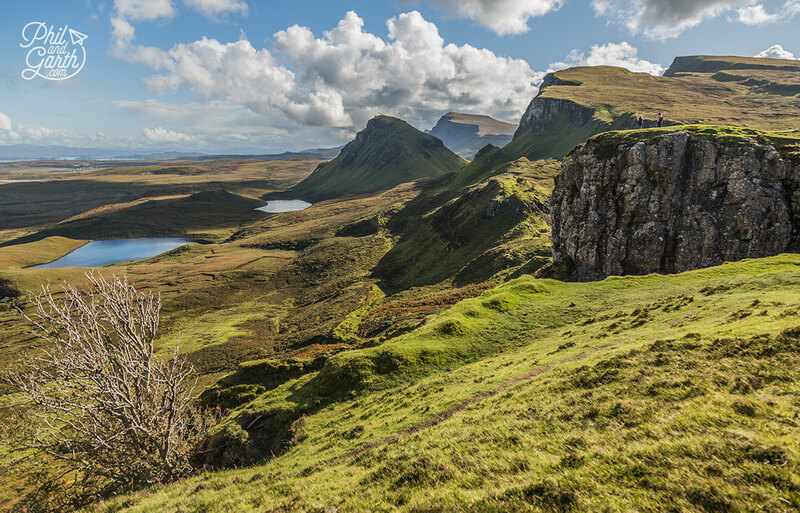 Your timing is impeccable – I am headed to Scotland and a wee bit of the Highlands in June. Pinning for reference. And love your photos! Wow! I seriously LOVE your photos, but enjoyed your video even more. I guessed you squeezed everything into 7 days that I’d love to see in the Highlands. Well done! !